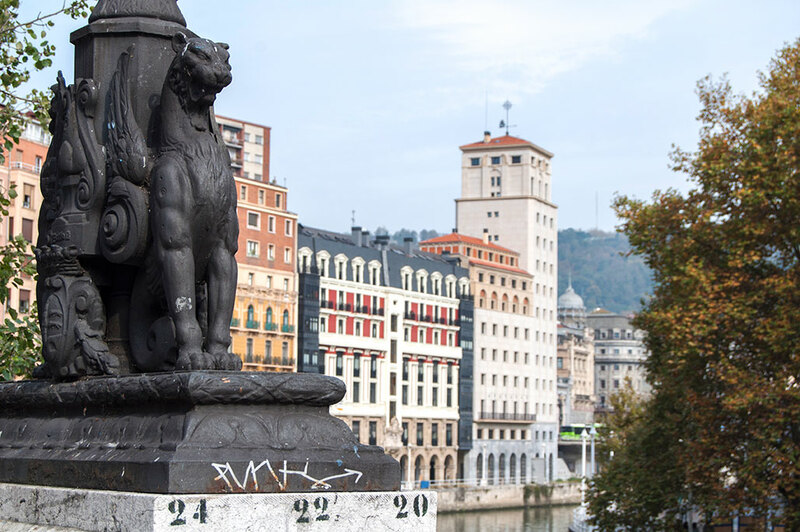 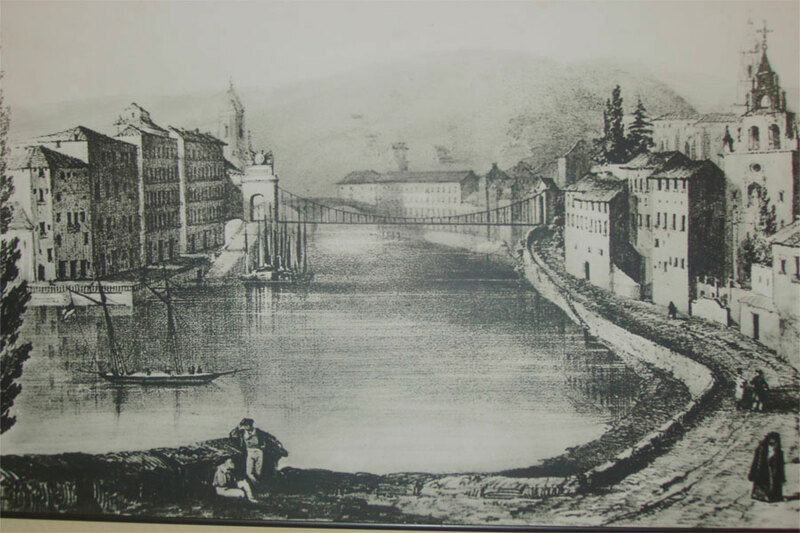 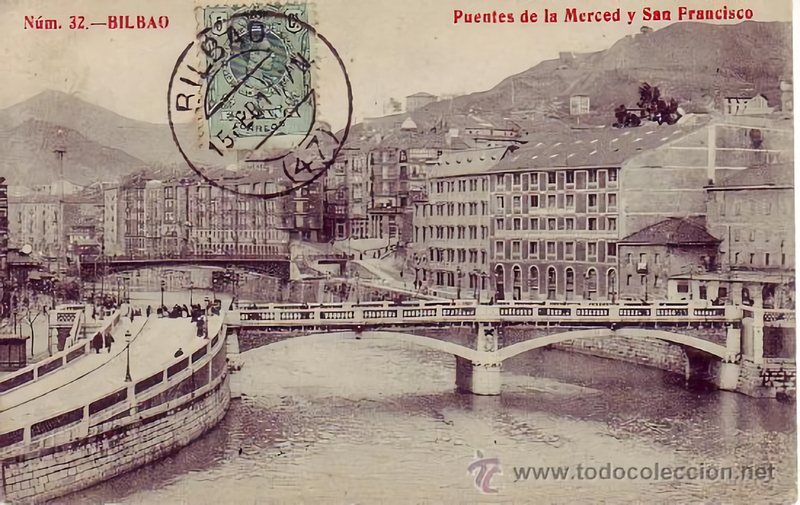 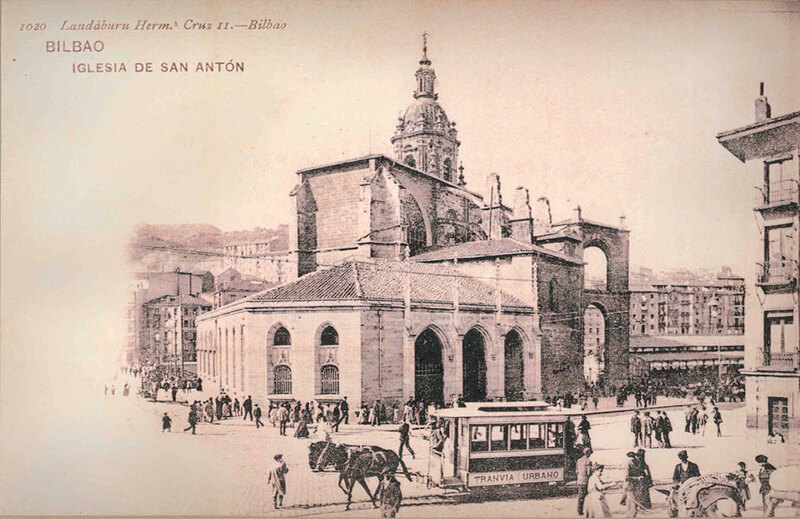 This is the district located on the shore opposite the Ribera Market; it is known by the name of Old Bilbao (Bilbao La Vieja) to distinguish it from the historic Old Quarter (Casco Viejo), also called the Seven Streets (Siete Calles). 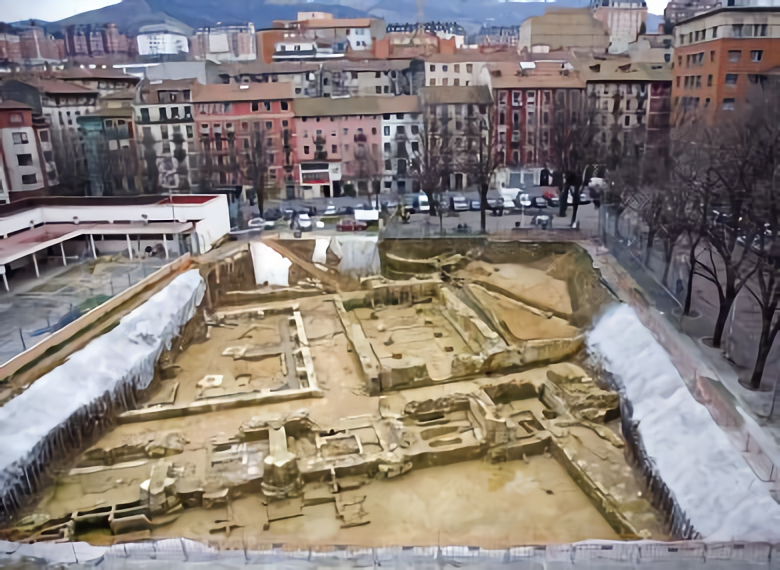 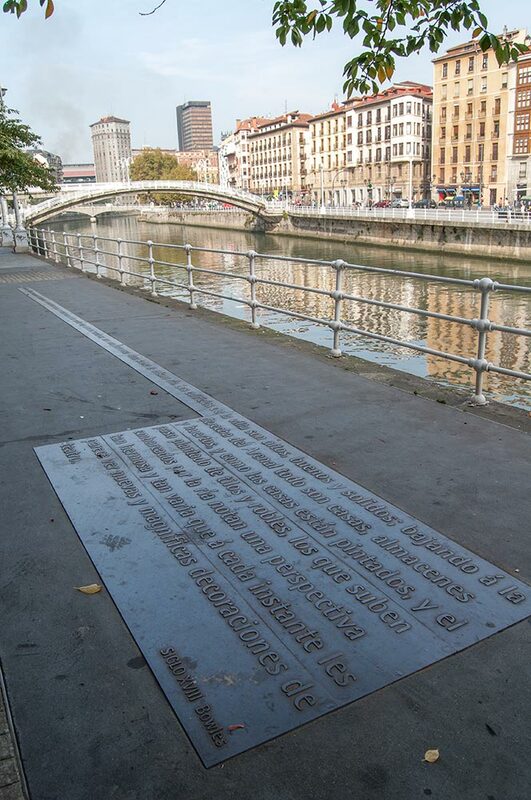 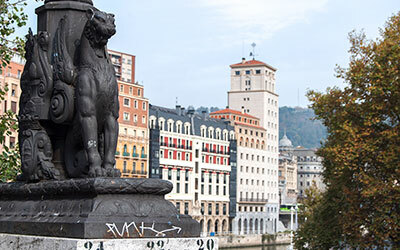 In the Middle Ages, this is where the Castilian wool that was later sold in Bilbao was delivered (bear in mind that the original city was, exclusively, the historical centre behind you) dating from its recognition as a town in 1300. 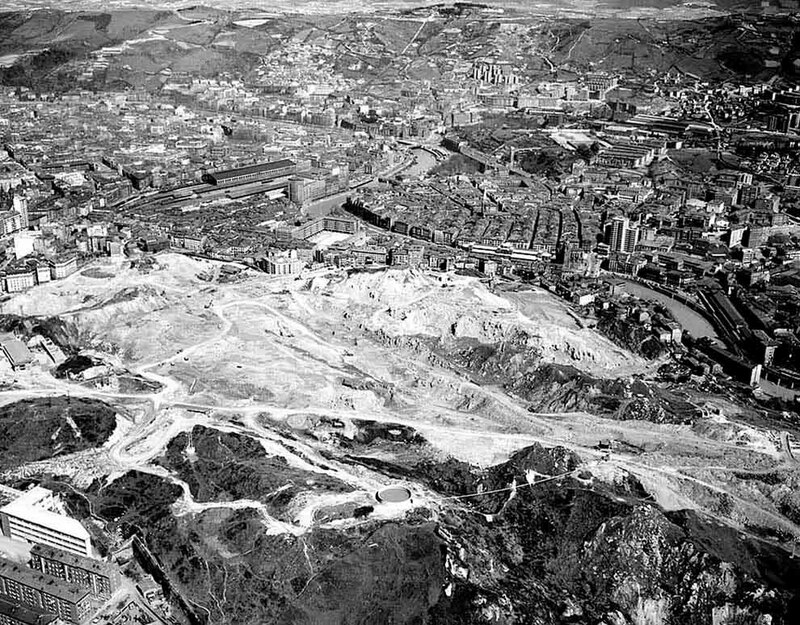 From the 17th century onwards, important iron mining groups coexisted here with residential suburbs, which meant significant levels of overcrowding and consequent serious health problems. 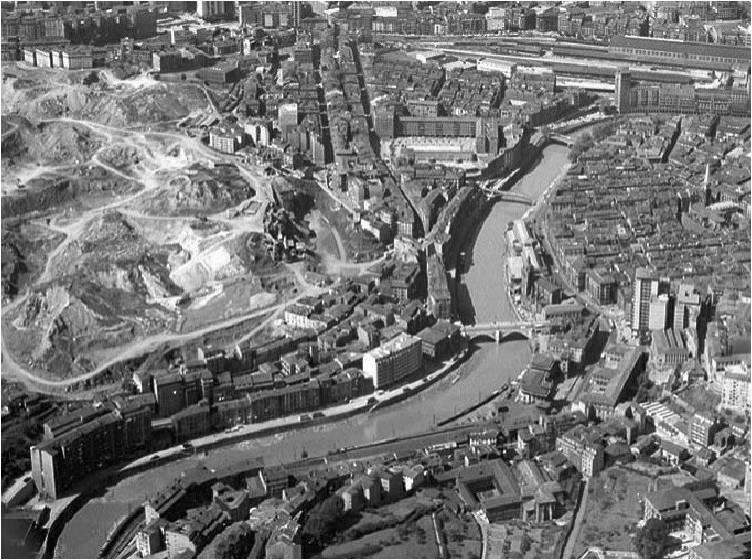 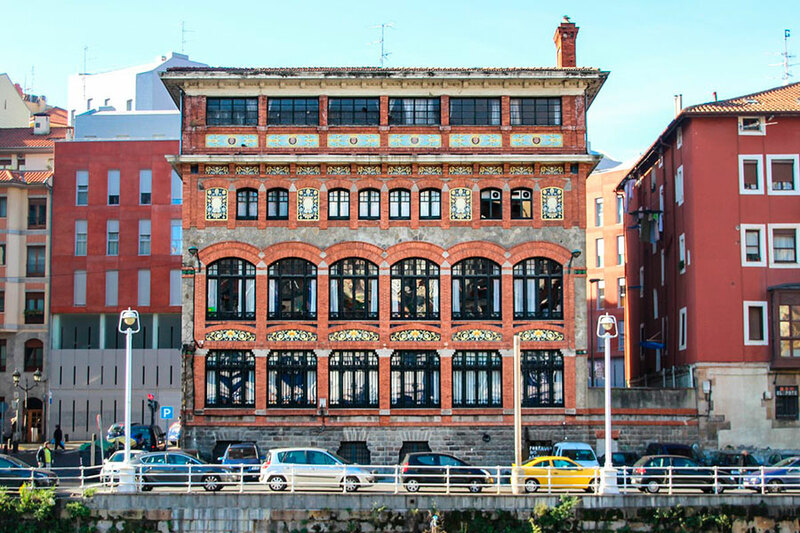 You can see where the multicoloured facades and balconies that were sailors' homes and the commercial premises of the original warehouses have been converted into shops and entertainment venues. 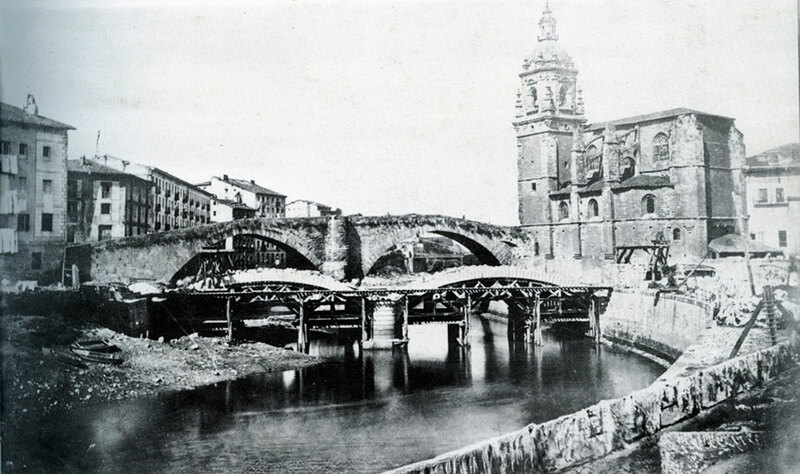 We cross to this side of the river by the historic bridge of San Antón (next to the market by the church) to go in search of these mining memories. 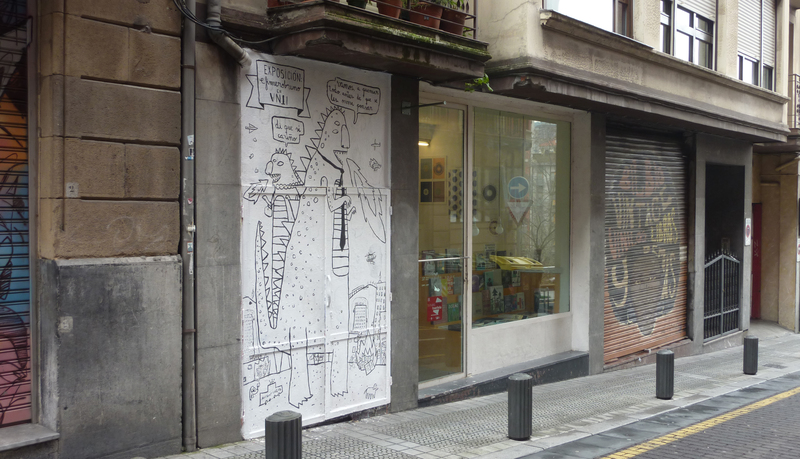 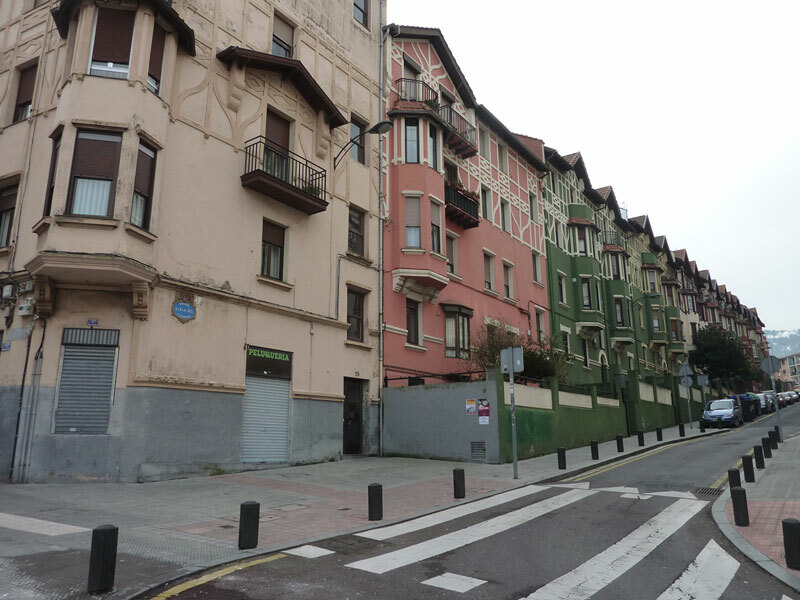 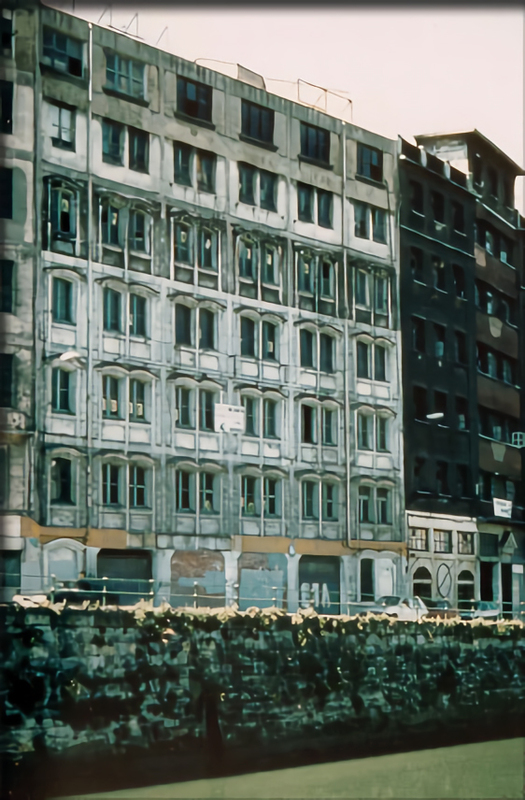 After crossing the bridge we are at the beginning of the street where you can see the old Bilbao "Casa Cuna" Daycare House (8) of 1916 which answered the pressing social need for improved sanitation and hygiene. 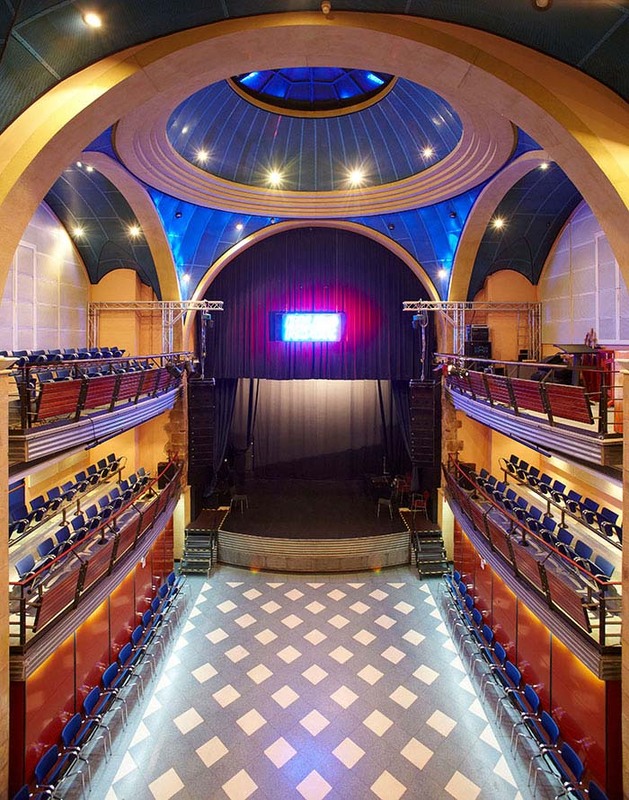 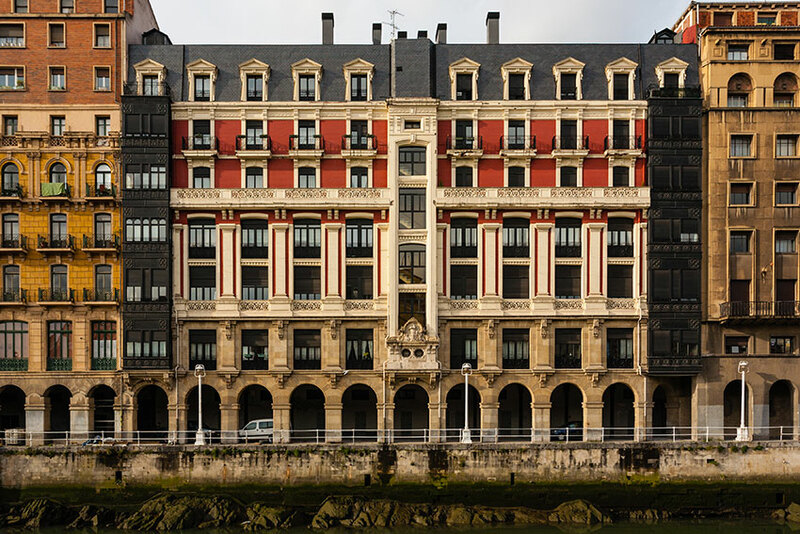 From a design by Ricardo Bastida, it has obvious reminiscences of Catalan Modernism. 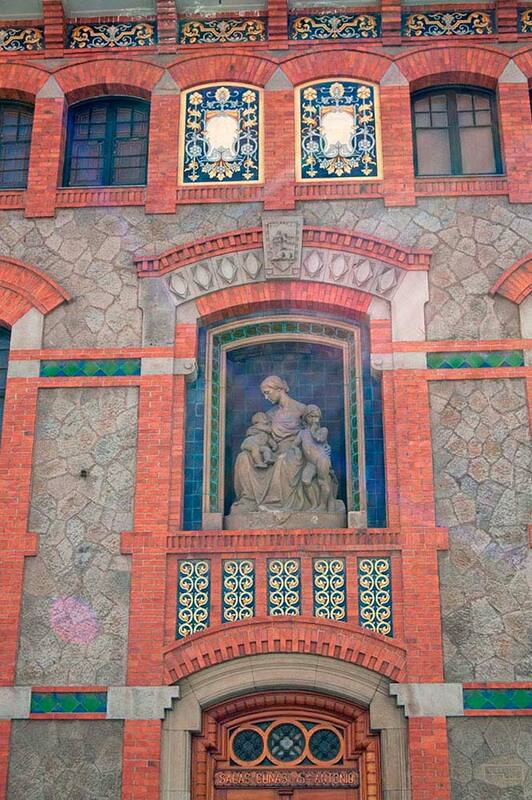 Above the doorway of the front door sits a sculpture of Charity, referring to the use of the building. 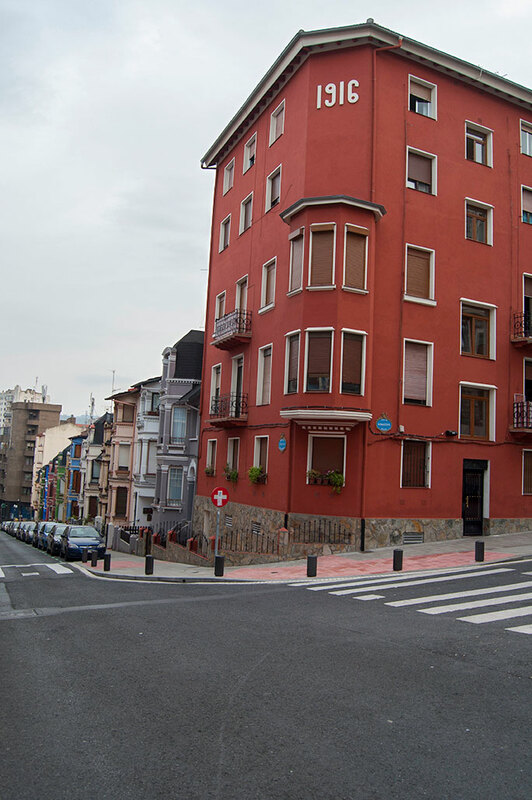 We continue walking down Claudio Gallastegui street and take the second turning on the right (Olano street). 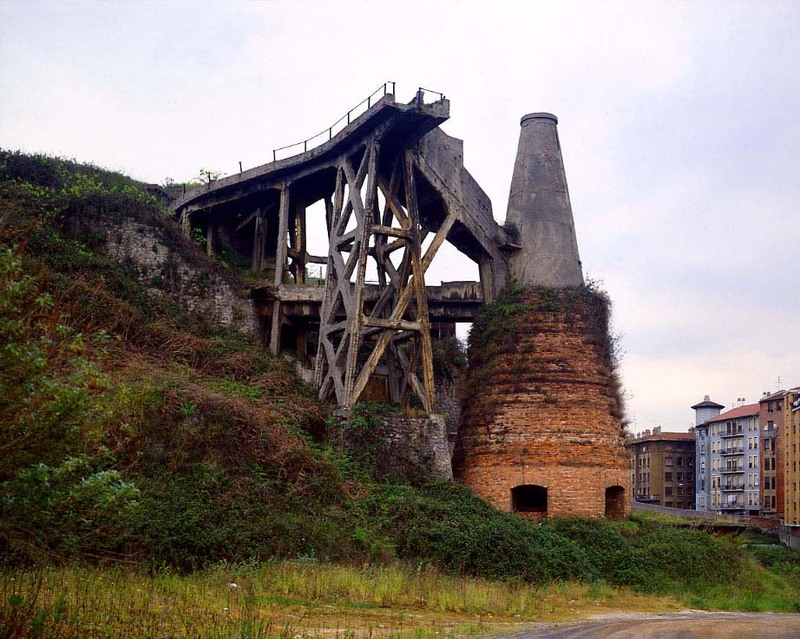 Here we find Plaza Saralegi (9), where one of the many iron ore calcinations kilns of the area stands, imposing and restored. 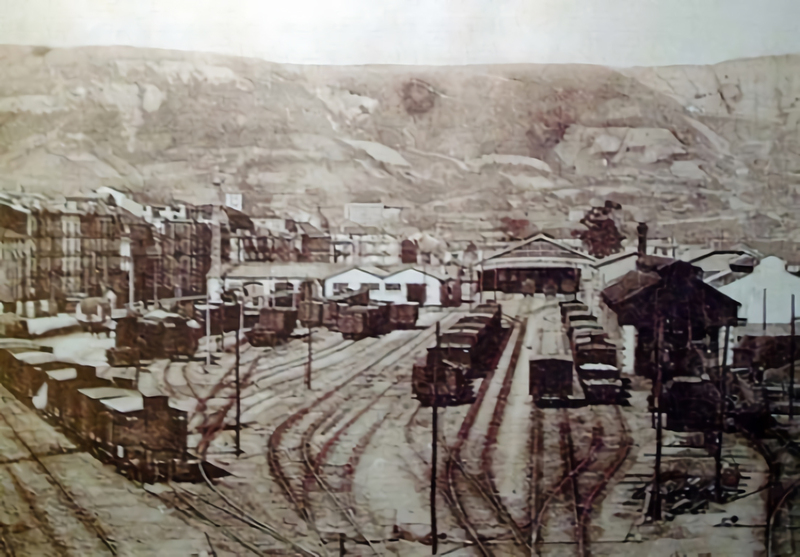 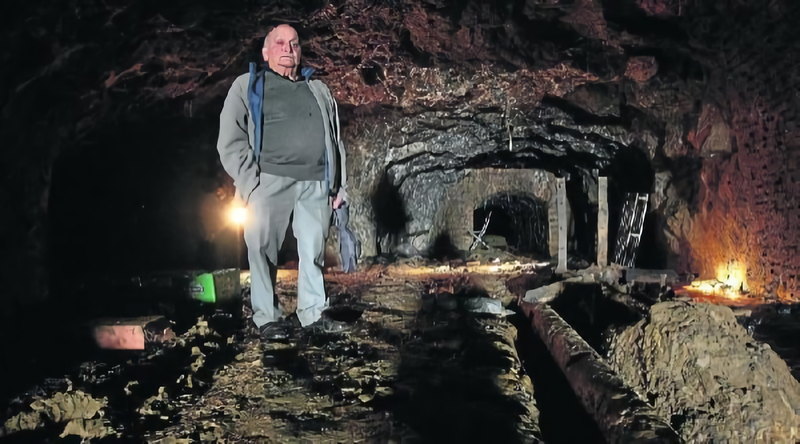 The mines were located in the 19th and 20th centuries in the nearby hills, and in these intermediate areas there were infrastructures for treating the ore before loading it onto barges that moved the cargo to larger vessels moored at the mouth of the river. 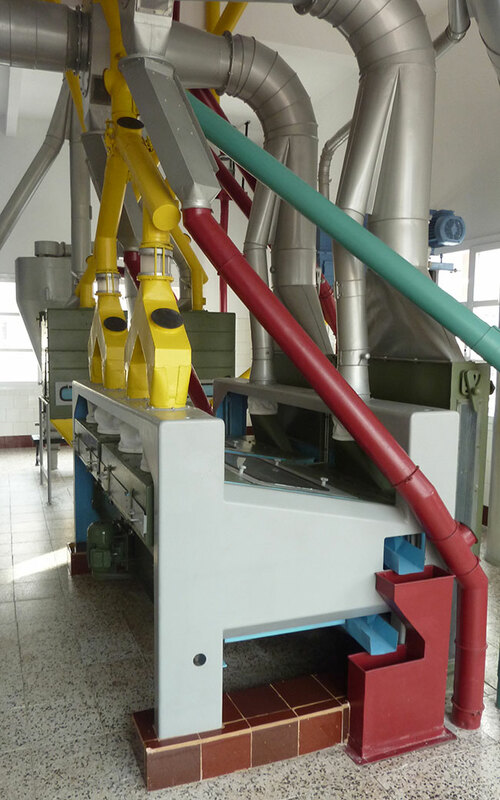 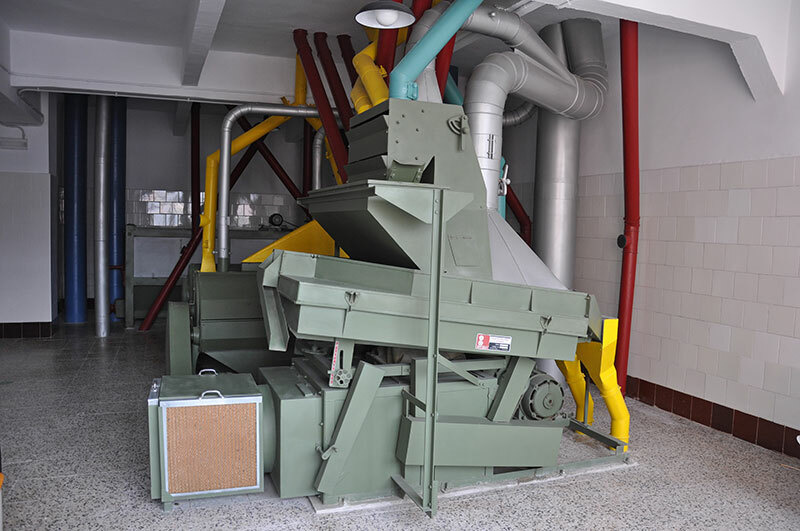 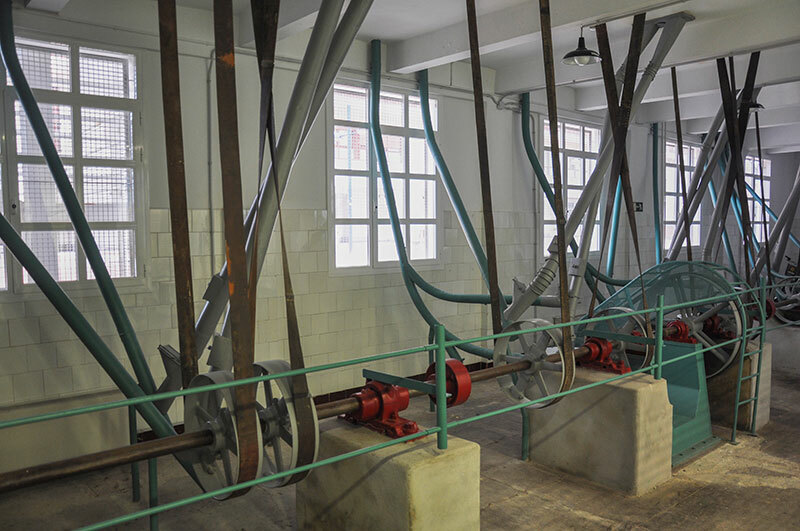 This restored kiln was for the calcination of the extracted ore, to convert it into a purer product for transport and subsequent handling. 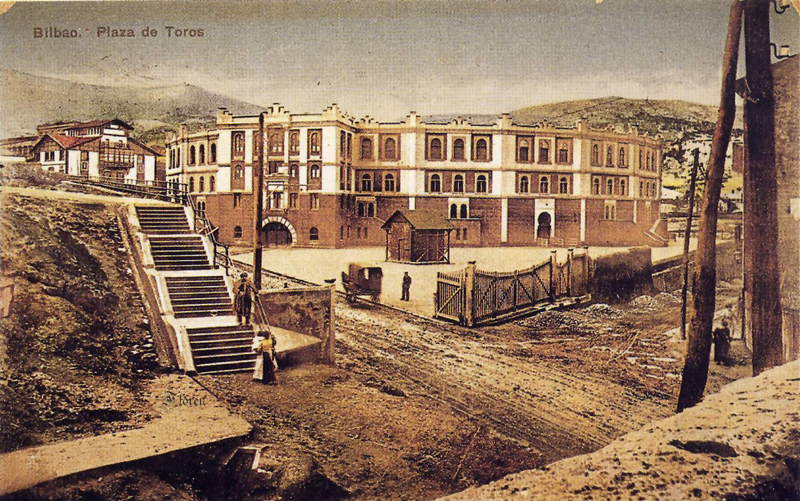 The building belonged to the San Luis mine, which was abandoned in 1960 and which, along with Malaespera and La Abandonada mines on this hill, and the El Morro mine on the opposite side of the river, contained the largest and best iron deposits of the area after the mining enclaves of Ortuella, Sopuerta and Somorrosto. 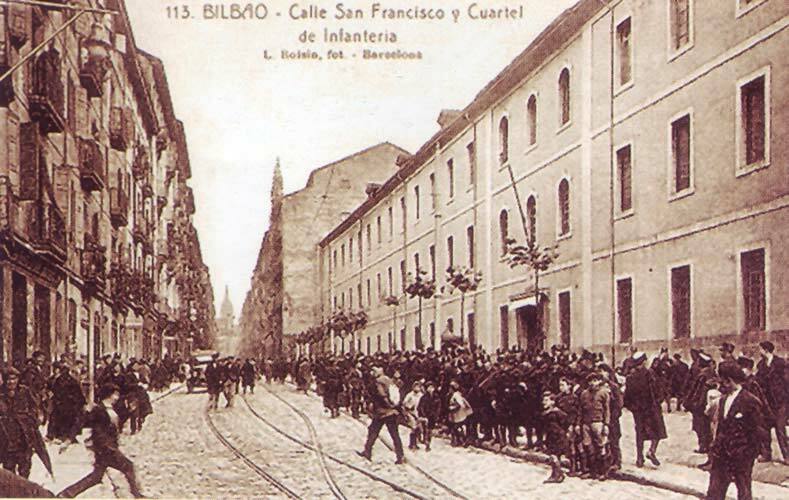 We walk down Tres Pilares street on one side of the square and connect with San Francisco street. 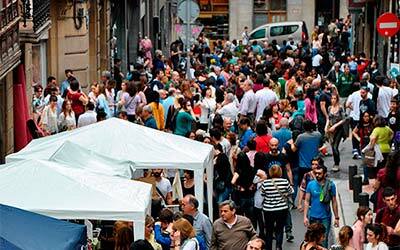 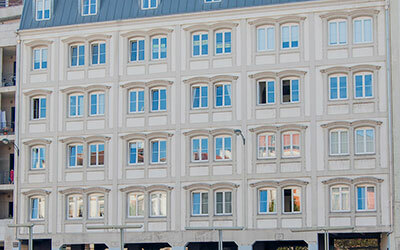 250 metres further on you can visit the Museum of Artistic Reproductions, at number 14 of this street. 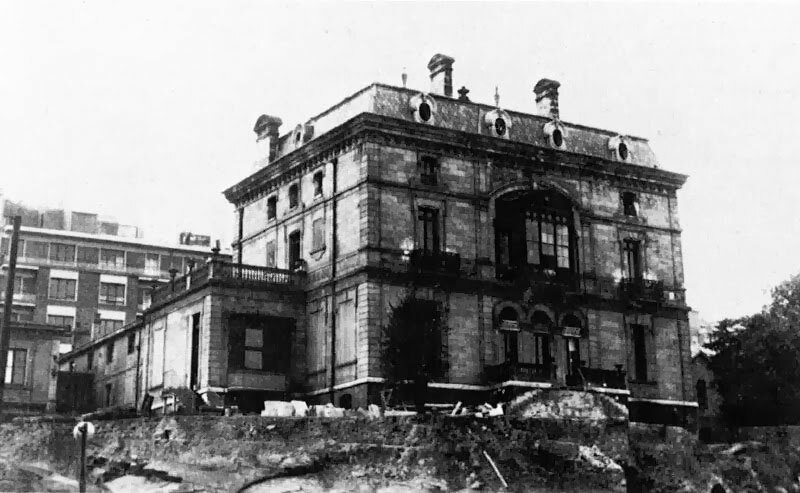 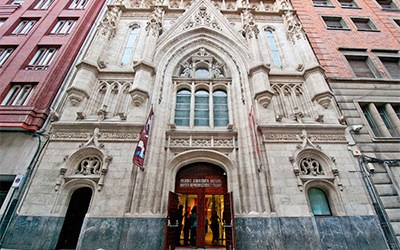 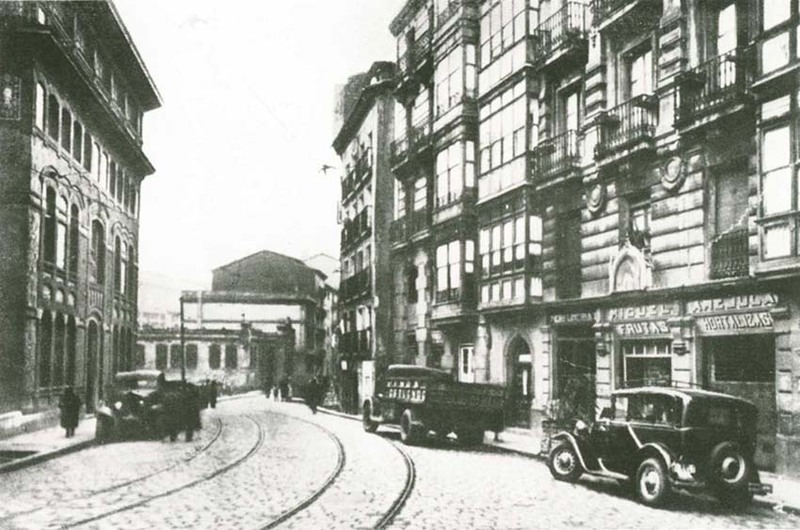 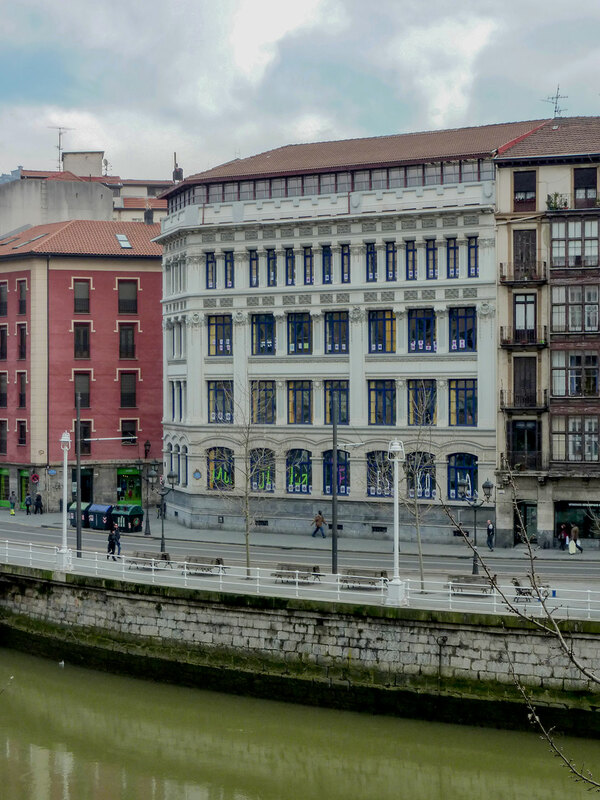 The museum, founded in 1927, is another cultural example of Bilbao’s thriving society. 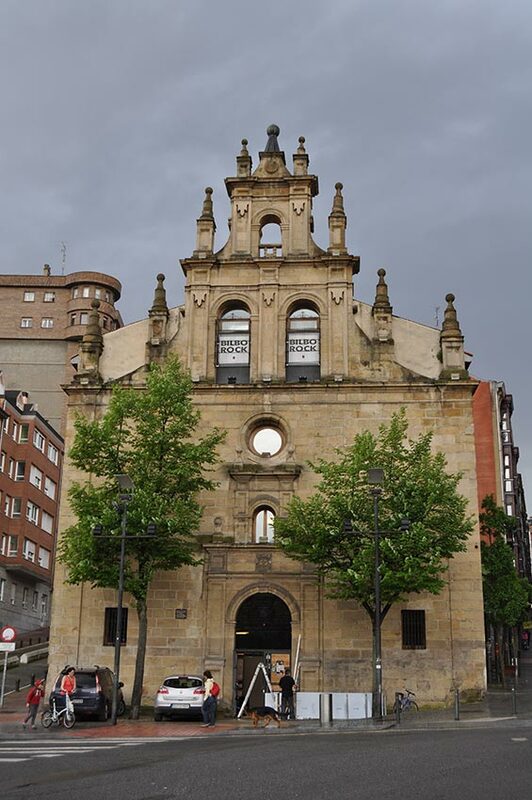 The value of the reproductions of the museum lies in the quality of the copies (many of them from the first mould); exact reproductions of works from the Vatican Museums, the Academy in Florence, the Berlin Museum, the Louvre or the British Museum, among others. 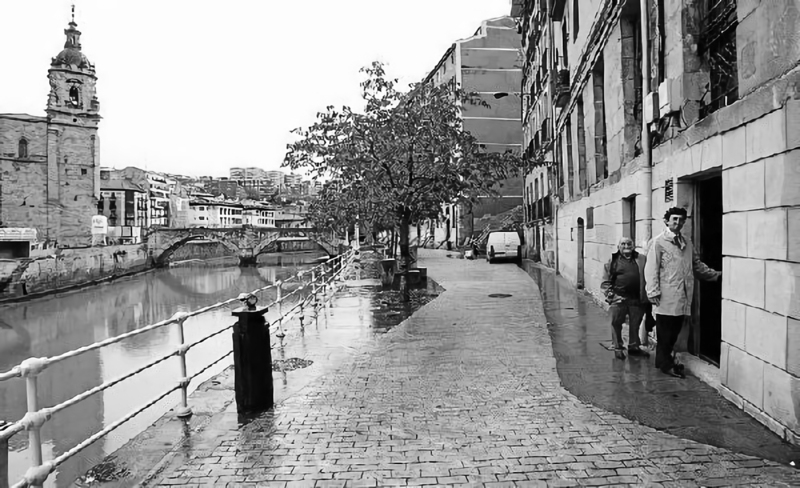 Going back down to the river by Conde Mirasol street, we arrive in Muelle de la Merced street. 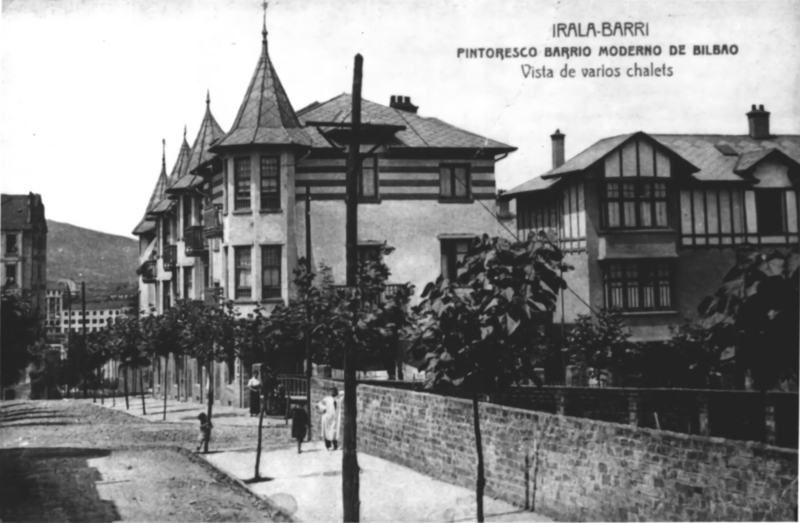 At No. 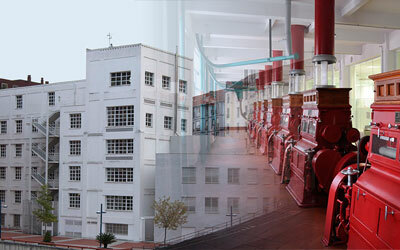 3 is old La Ceres flour factory (10). 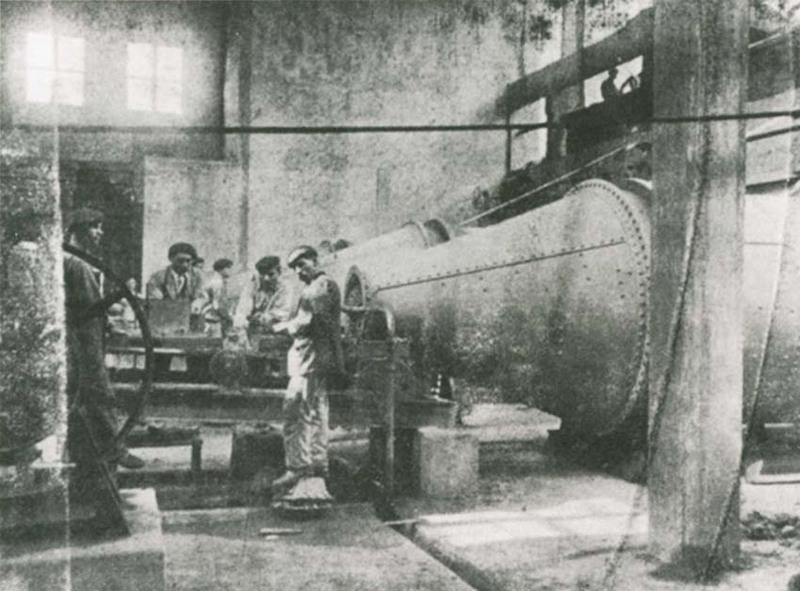 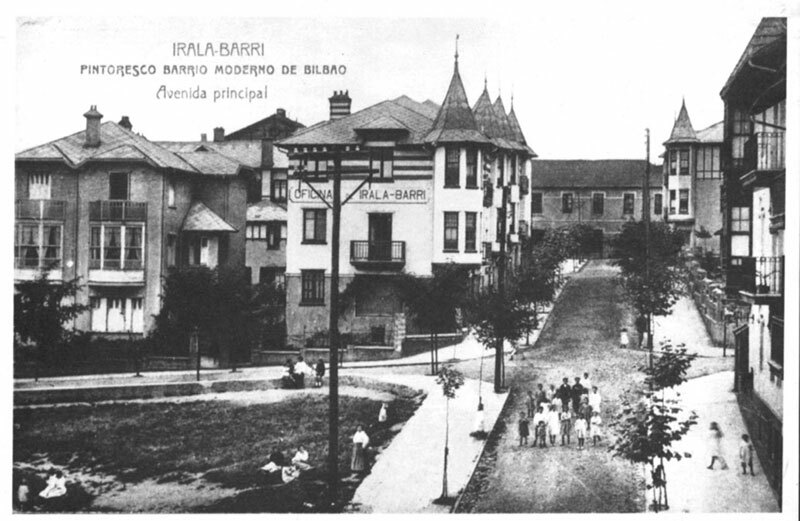 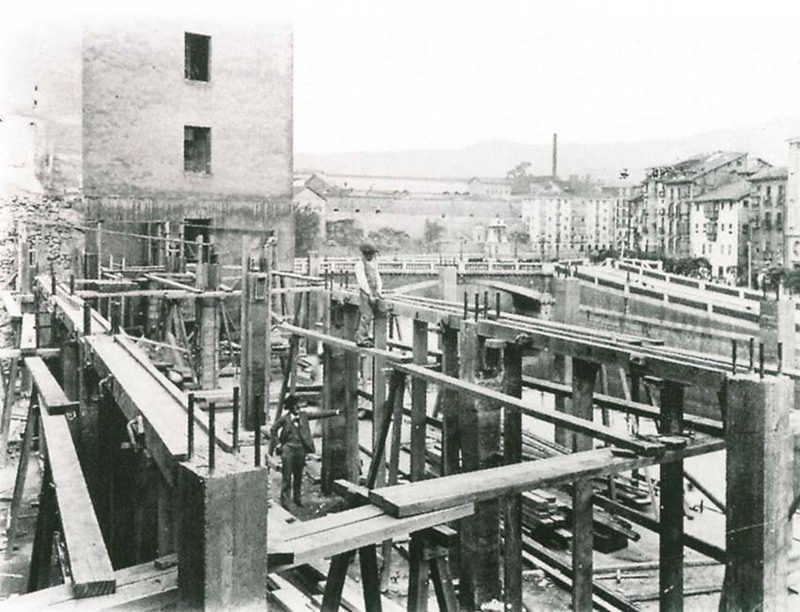 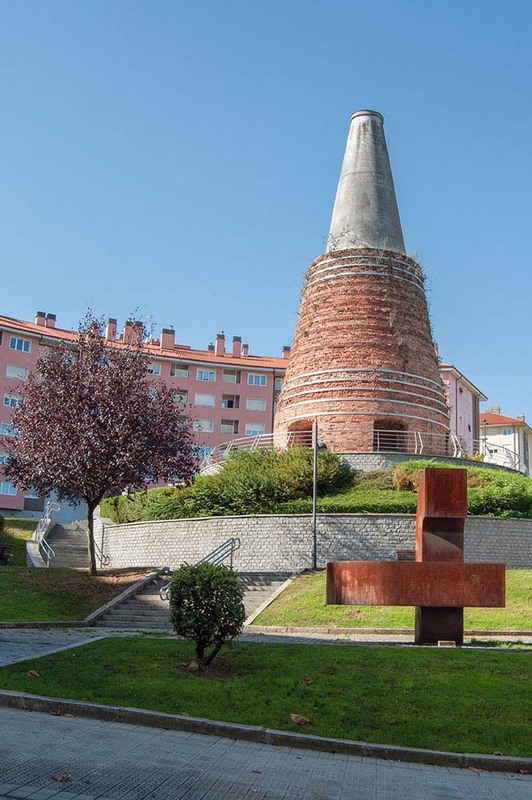 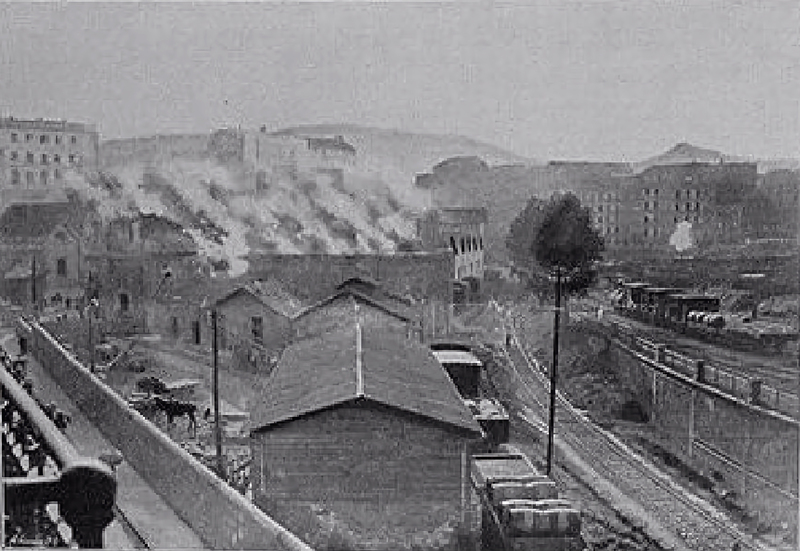 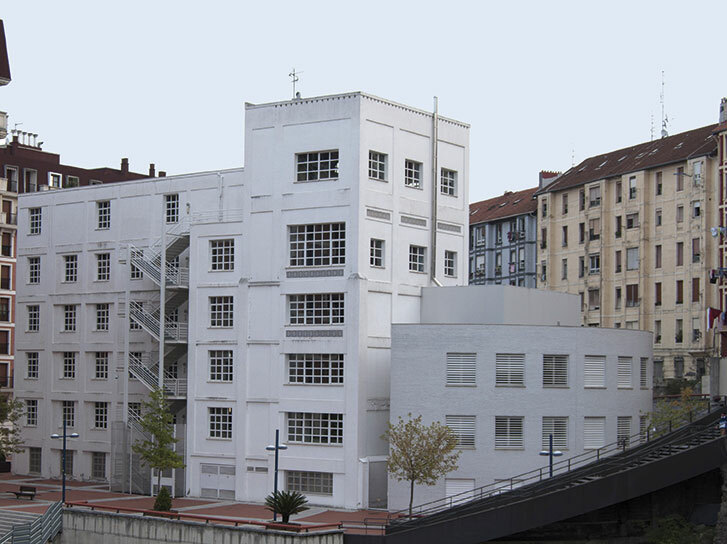 This was the first building in Spain to be built of reinforced concrete using the Hennebique system (1899-1900) and marks a technological milestone in Basque industrial architecture, which makes it a building of Cultural Interest. 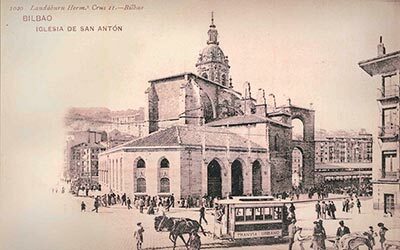 It was finished in 1900 and was built in a record time of 7 months by the young civil engineer Ramón Grotta and the architect Federico Ugalde. 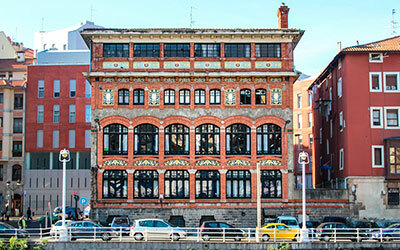 Originally it had 6 floors; when it was restored, the facade was kept and the interior was converted into flats. 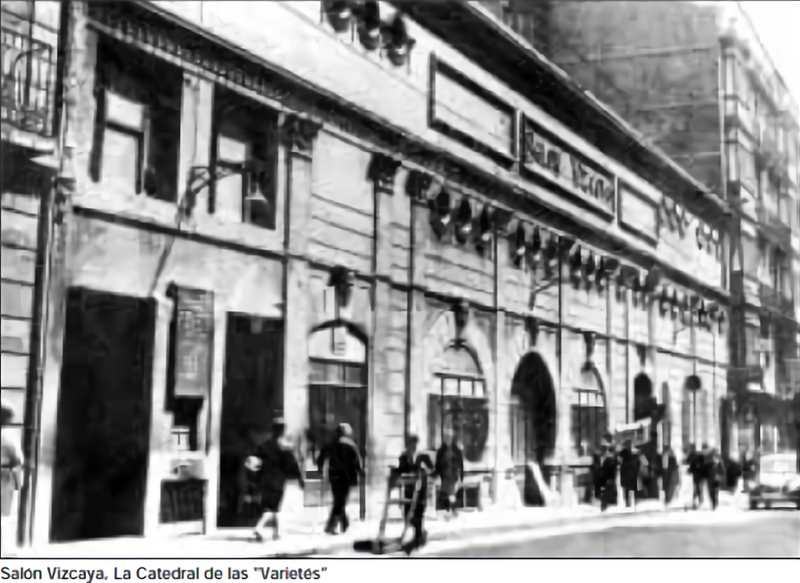 Continuing along the road, we pass in front of the historic Church of La Merced, now deconsecrated and used for musical and artistic events. 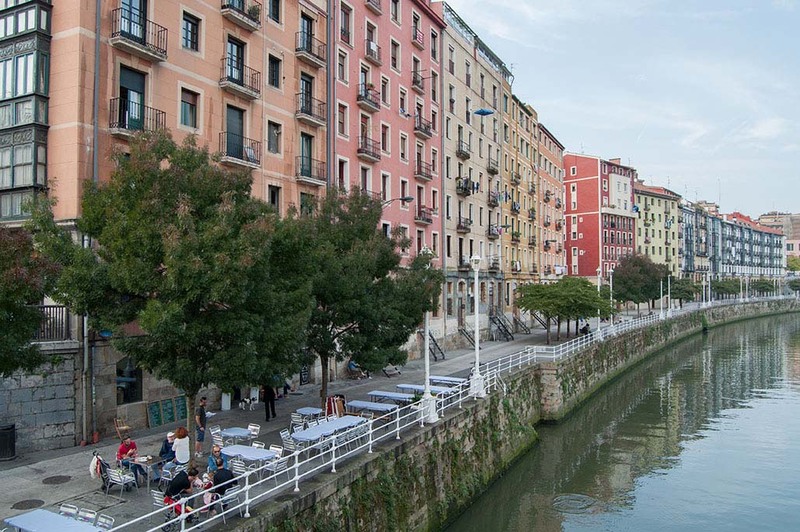 Before reaching Bailén street, on the right we can see another remarkable set of facades of residential buildings and offices facing the river. 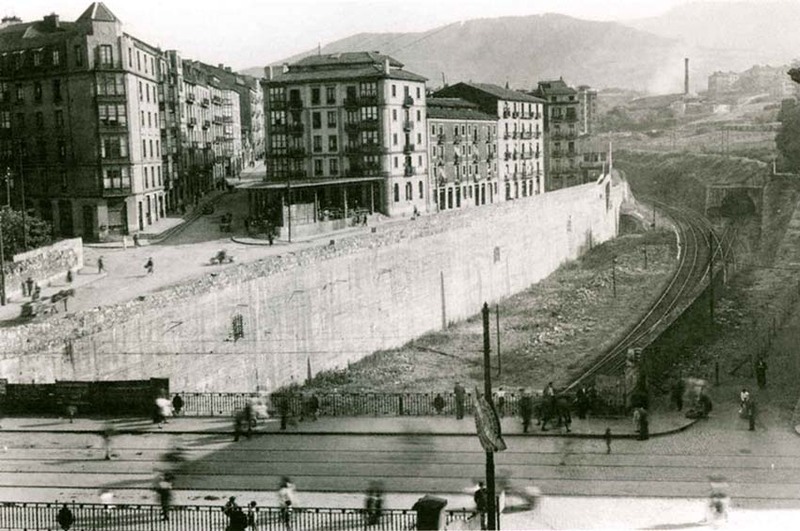 In Bailén we turn left; at the beginning of this section, on the right hand side, there is a long wall that hides the railway lines. 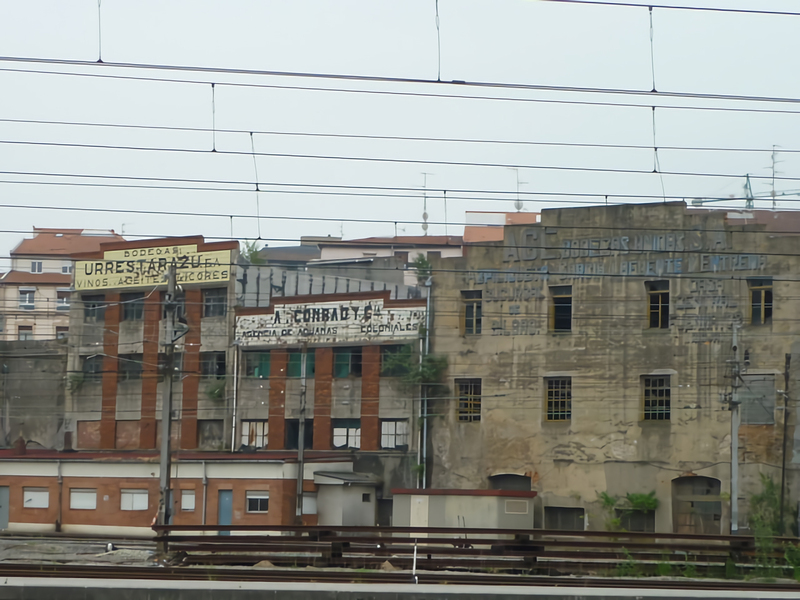 At the end of this wall, we see a street of agribusiness warehouses built between the 1930s and 1950s; they had a logistically unparalleled location for using the railway in their business operations, connecting with the port and the south of the peninsula. 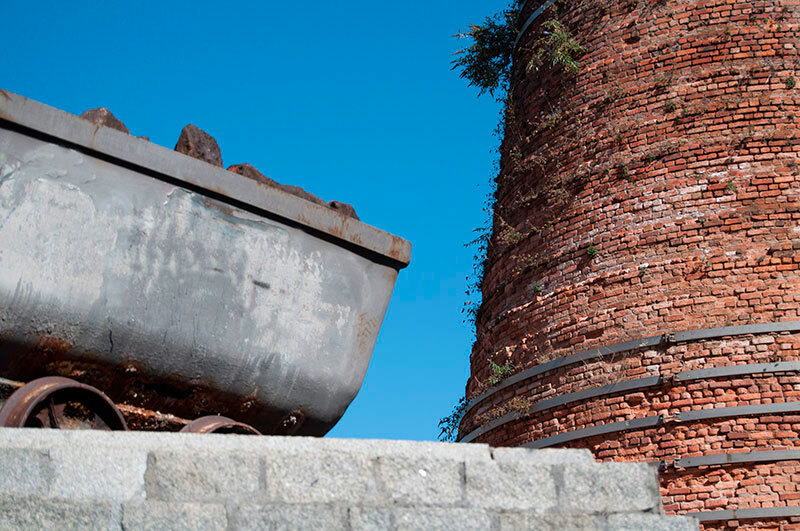 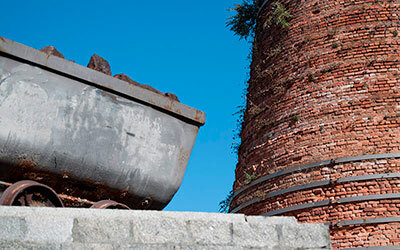 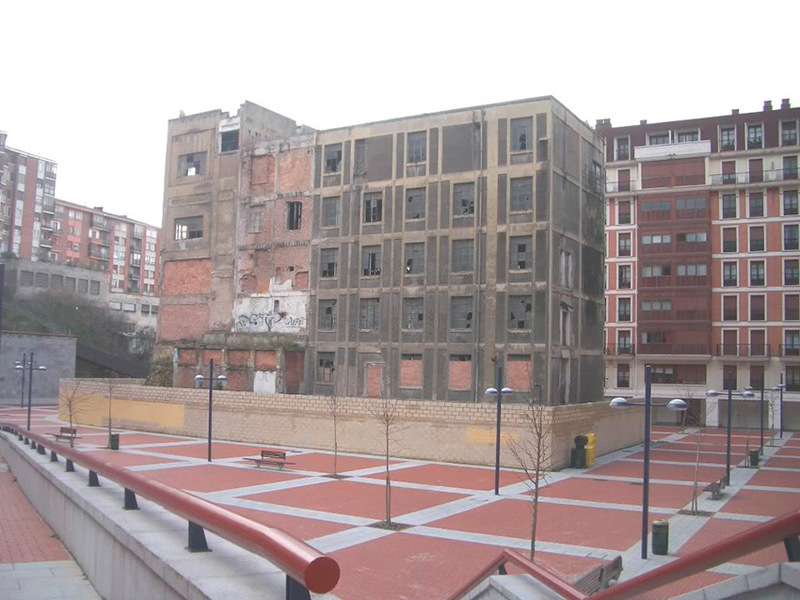 Their current state of dereliction will be changed by the final project for covering over the current shunting yard, but they are a remarkable set of facilities with a high iconic value that became one of the industrial areas with the most character in Bilbao. 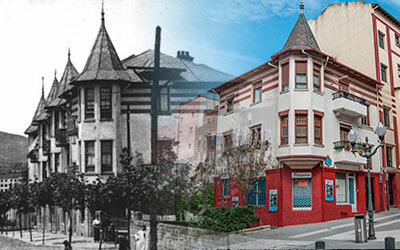 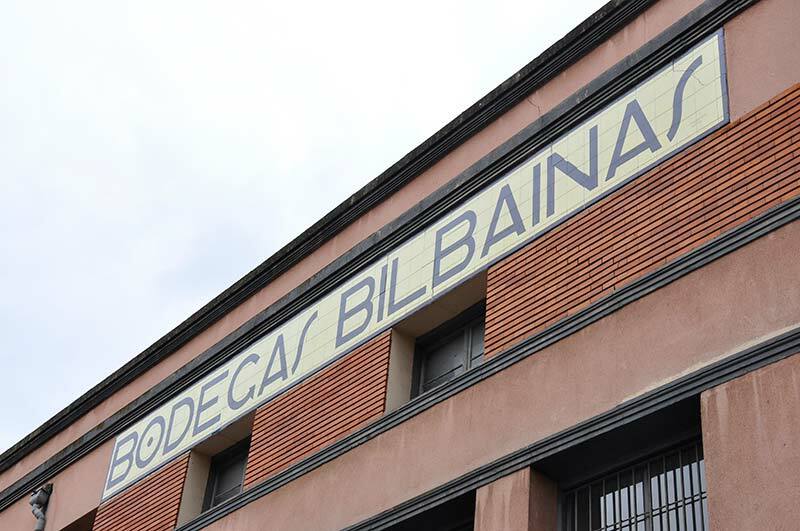 At the head of the street is the unique building of the Bodegas Bilbaínas Wine Warehouse (11), rebuilt in 1941. 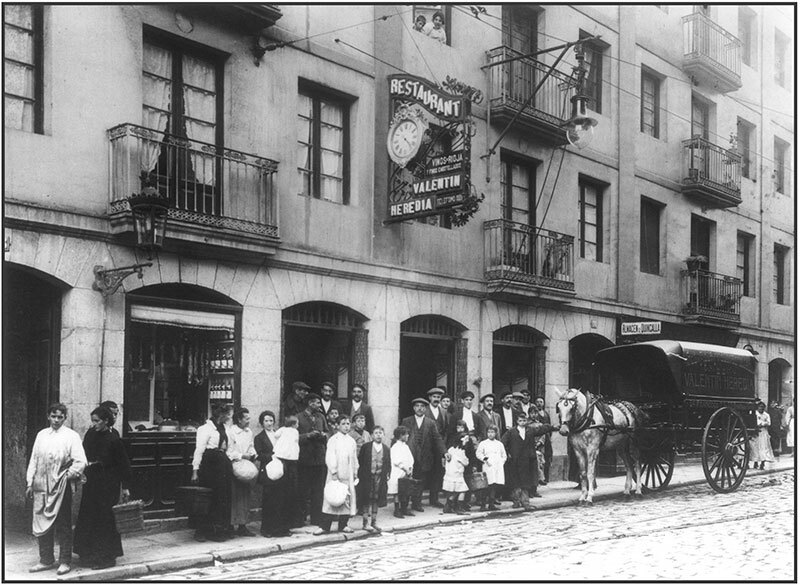 We continue to San Francisco street. 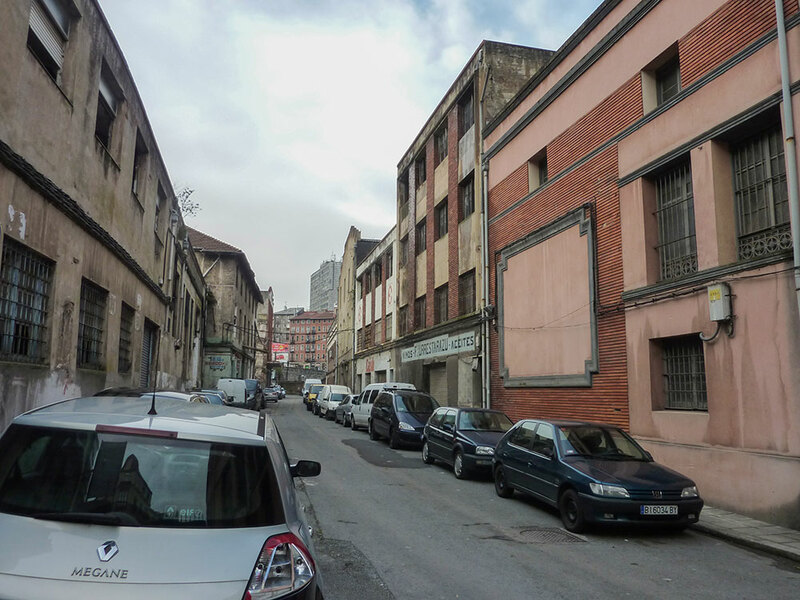 This street and the neighbourhood of the same name, named after the Franciscan monastery that stood there until the middle of the 19th century, until the 1980s housed the nightlife of the city with clubs, cabarets and cinemas, now closed. 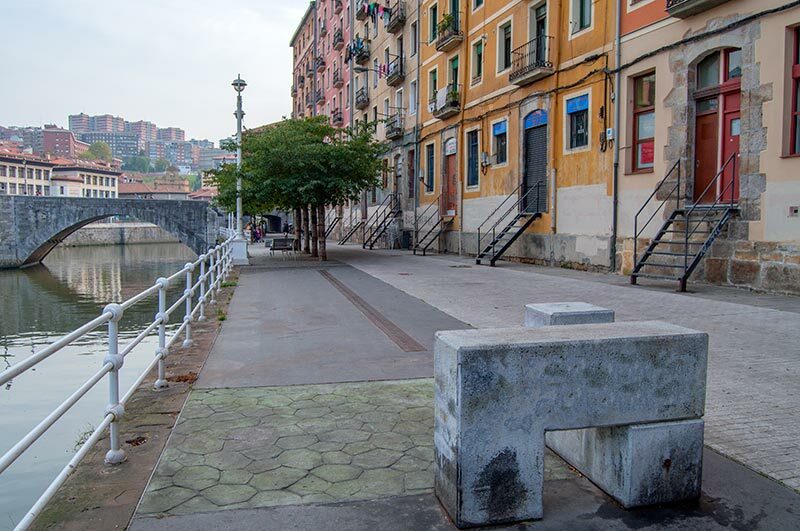 Now it is a neighbourhood full of contrasts with important public actions to combat the deterioration of its streets. 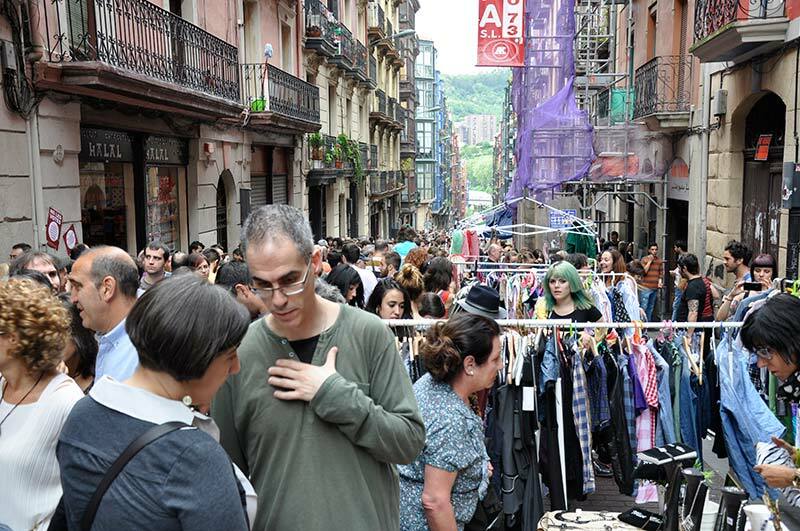 It remains true to its historical essence of great permissiveness towards all kinds of social groups, which means that its streets look naturally on a notable presence of gay bars, nightclubs, immigrants from around the world and innovative art or clothing shops and cafés. 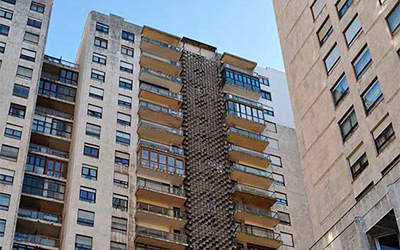 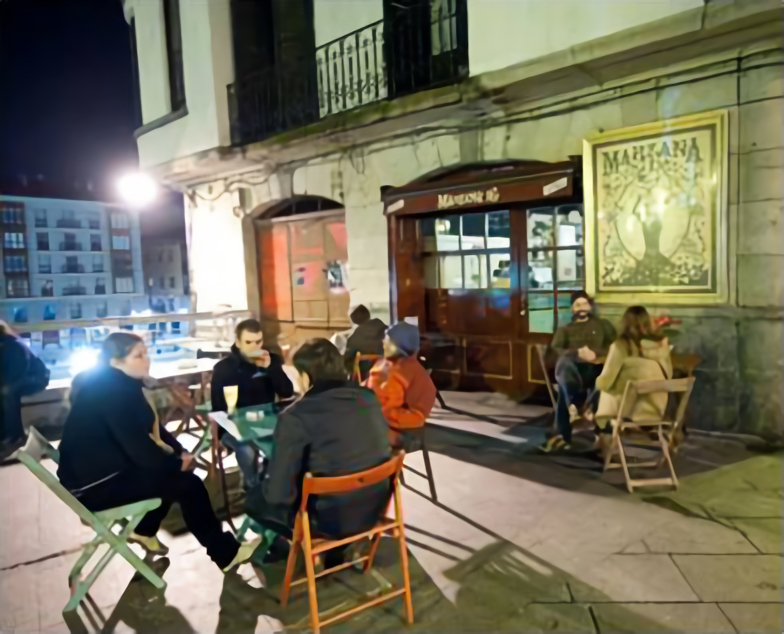 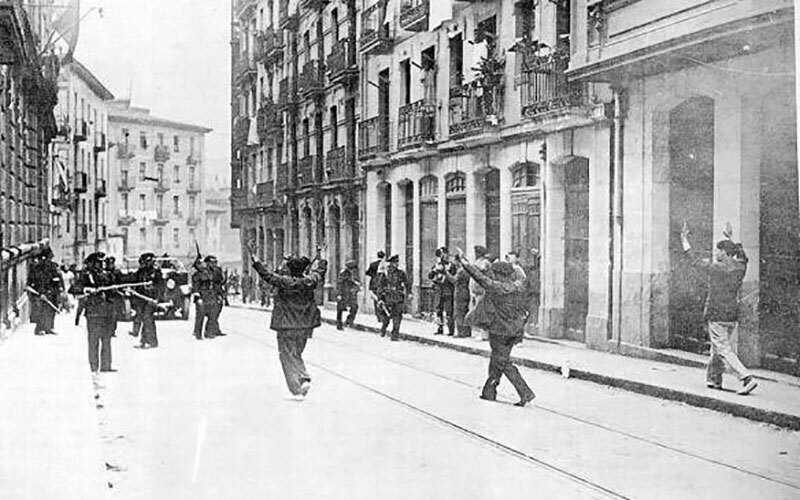 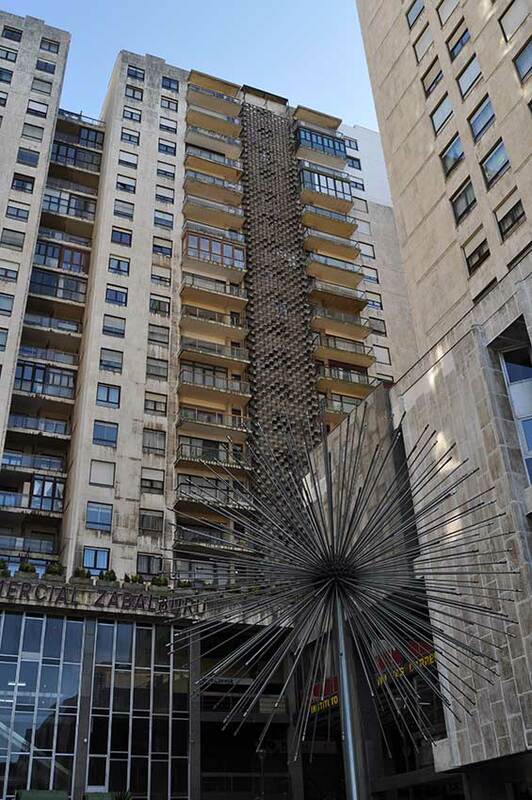 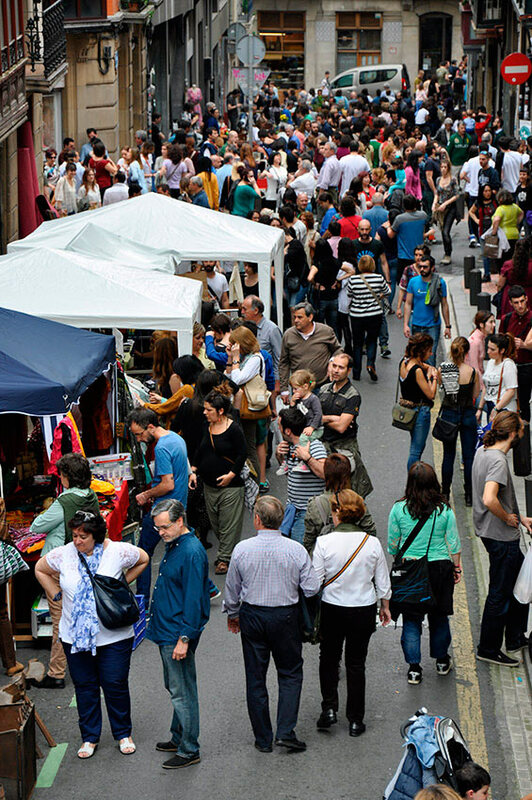 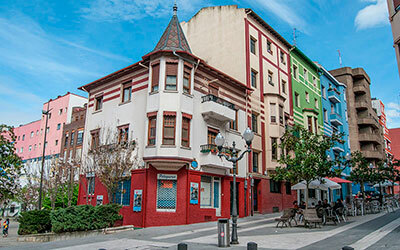 Crossing the Cantalojas bridge and reaching the Plaza Zabálburu, walk along one of the side streets, Pedro Martínez Artola street, to connect with Irala street. 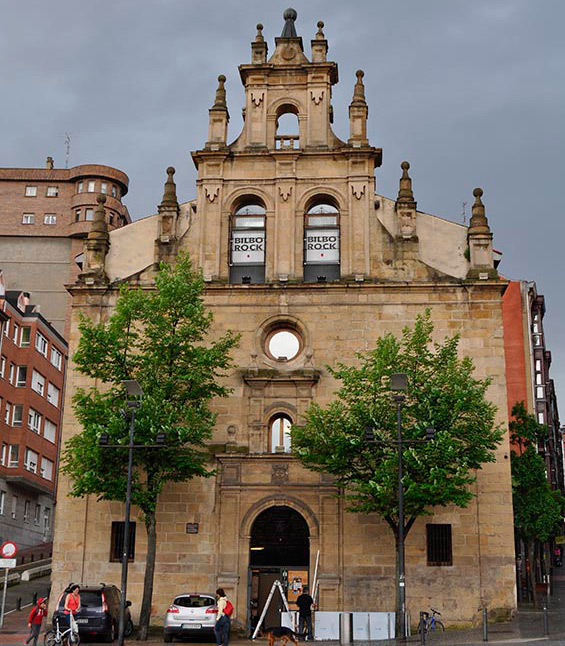 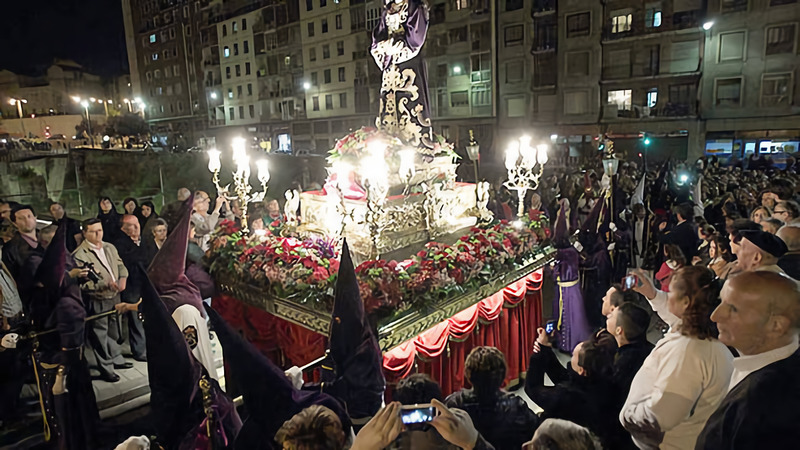 When you reach Reyes Católicos street, turn left. 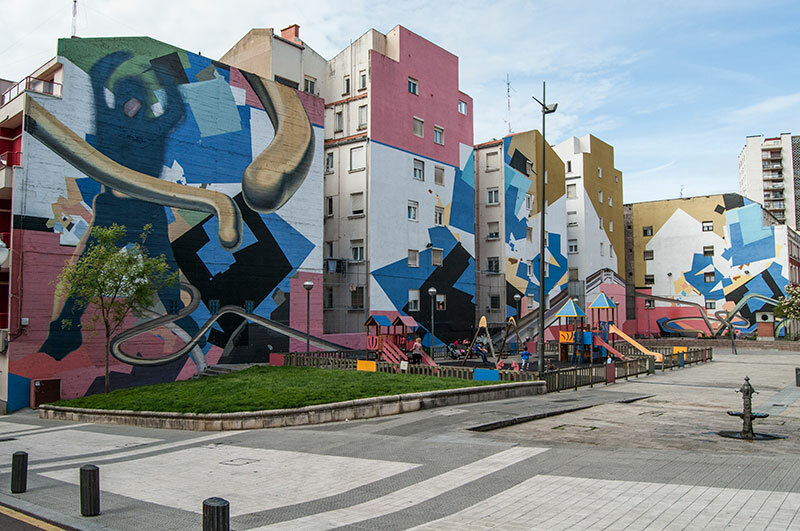 On the first corner of the street (Kirikiño) you will see a square with facades covered in murals. 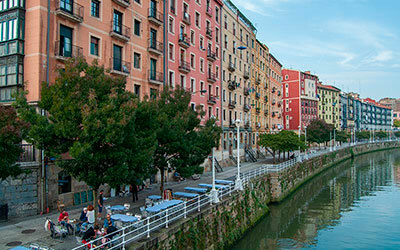 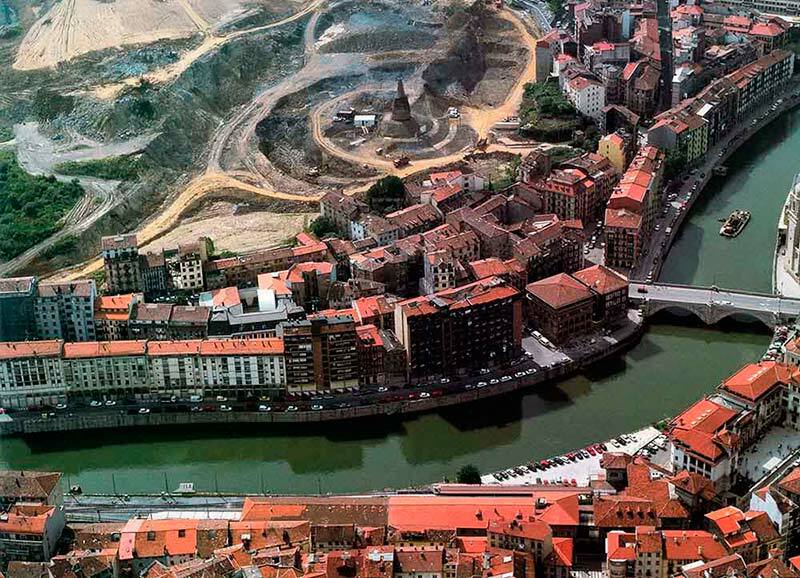 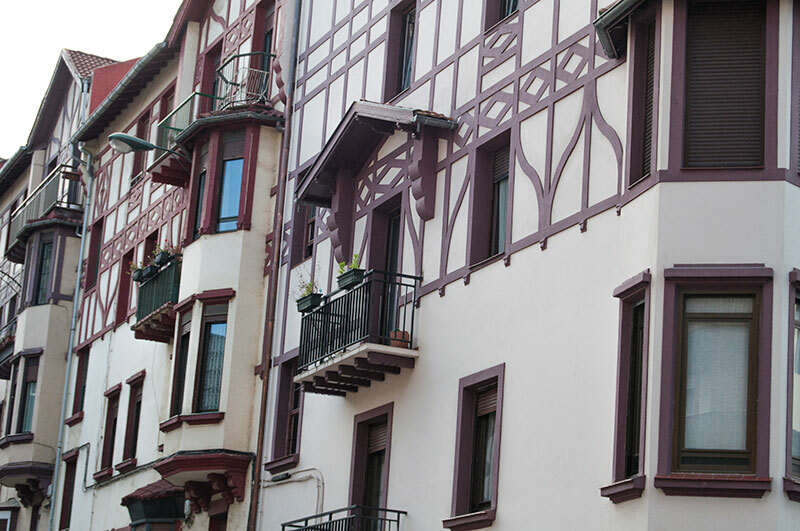 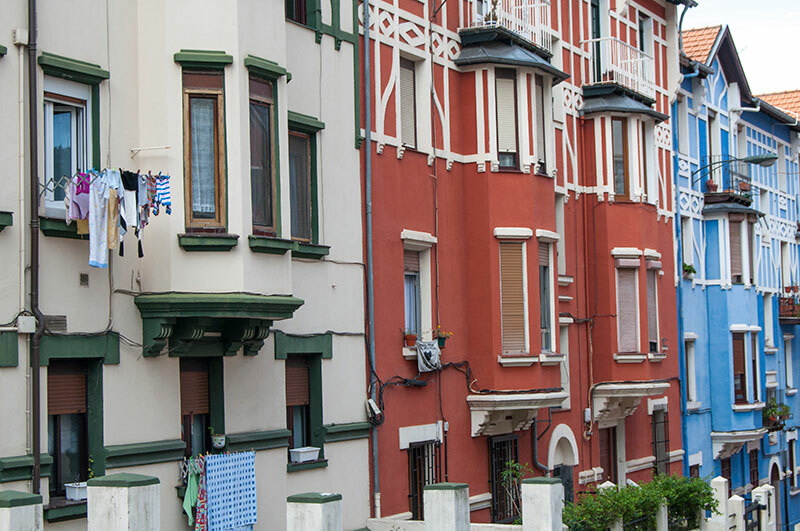 This point shows the widespread concept of "cheap houses" both in the city and in Bizkaia. 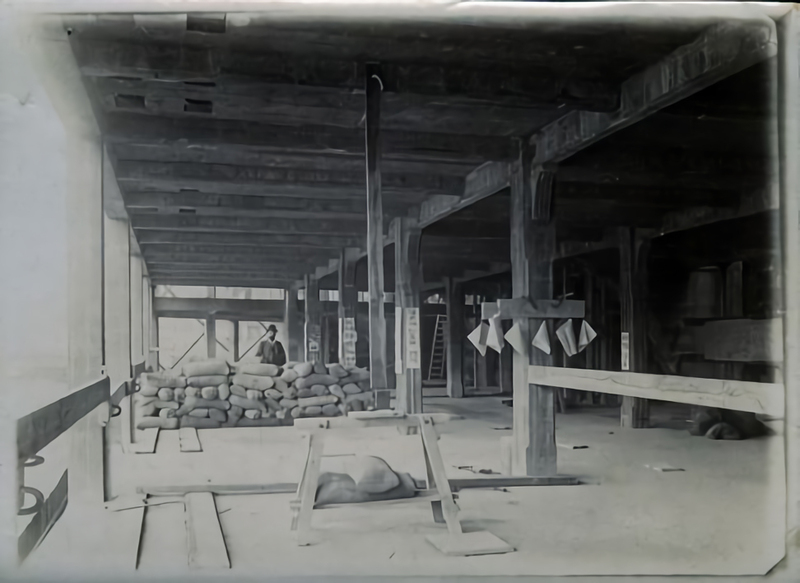 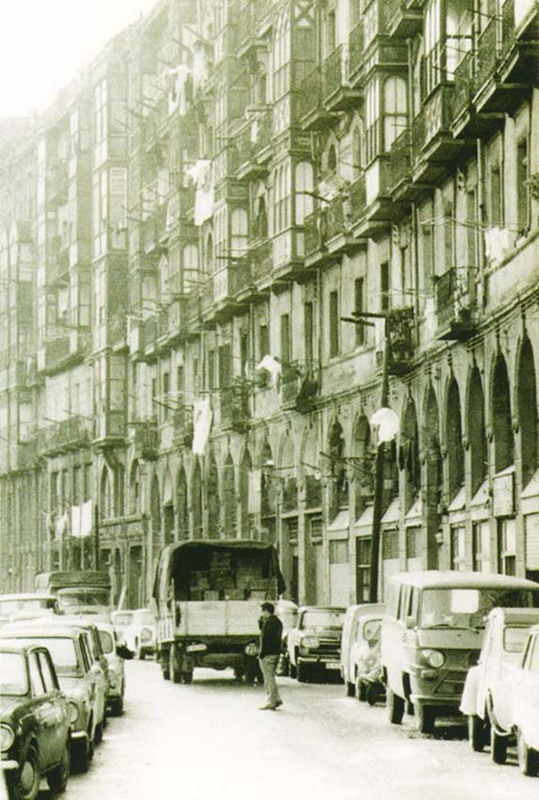 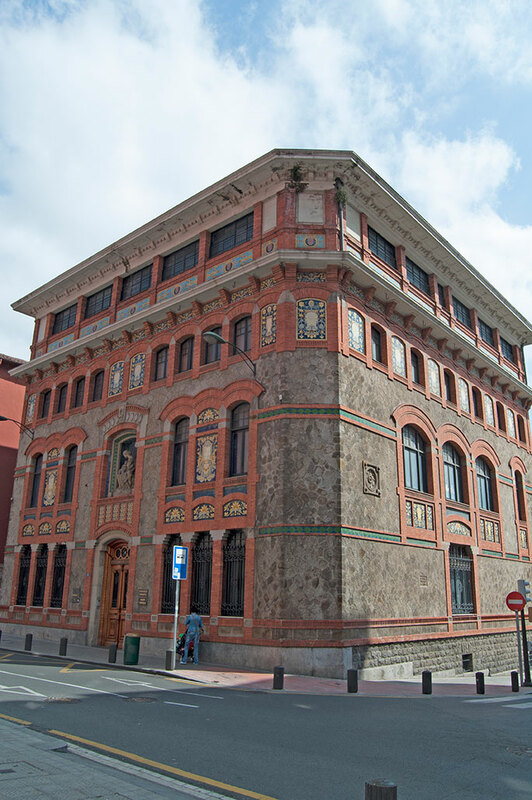 This was a style of building backed by many kinds of cooperatives and by companies themselves, who took advantage of the aid and beneficial concessions provided by laws in the early 20th century. 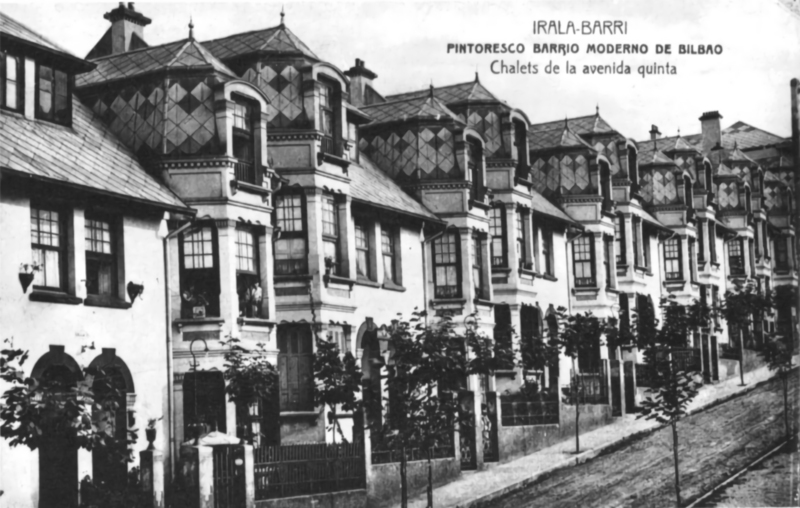 You are in the city district of Irala (12), which is the area that has the most buildings of this type of architecture. 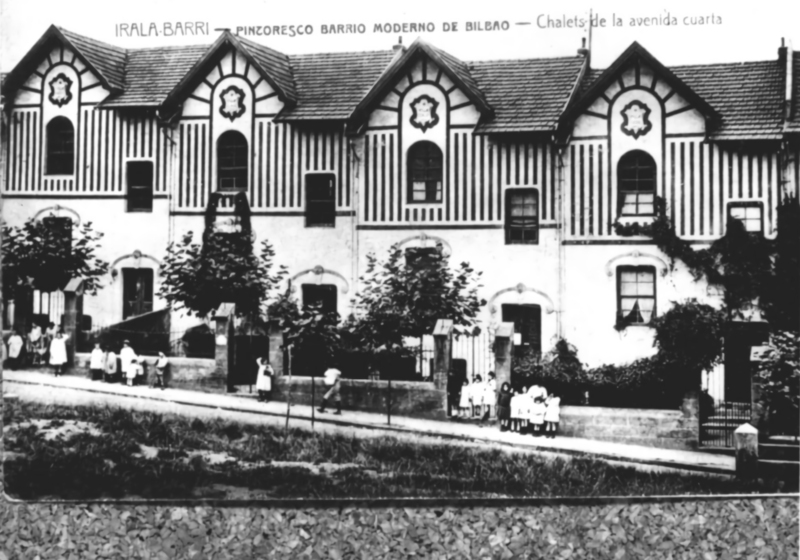 In fact, these are houses built by the flour and bread-making company Harino Panadera, founded by Juan José Irala, from whom the district gets its name. 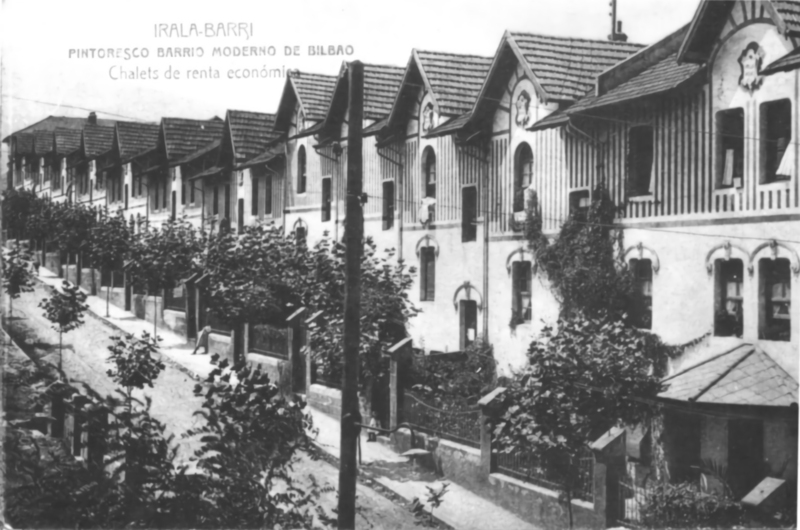 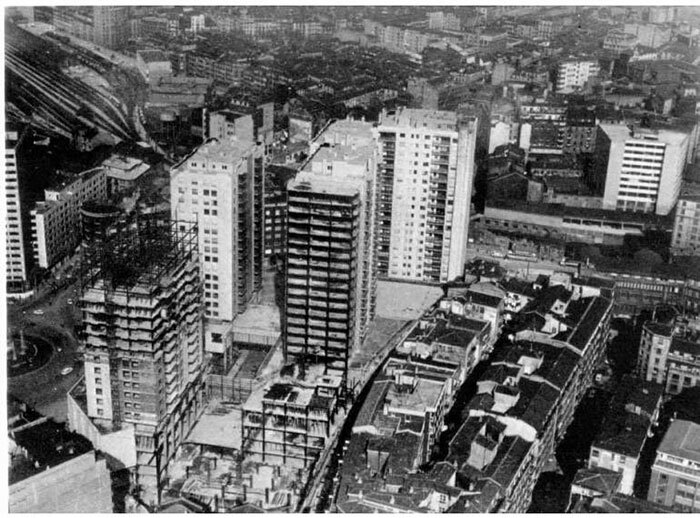 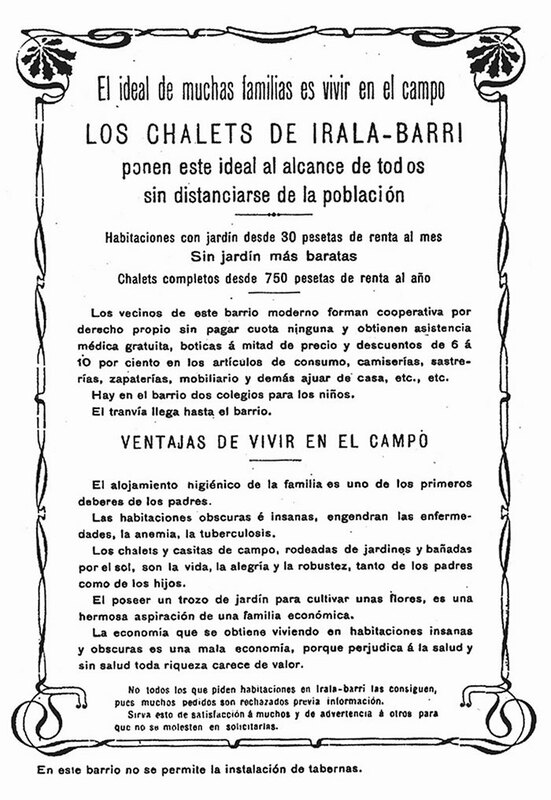 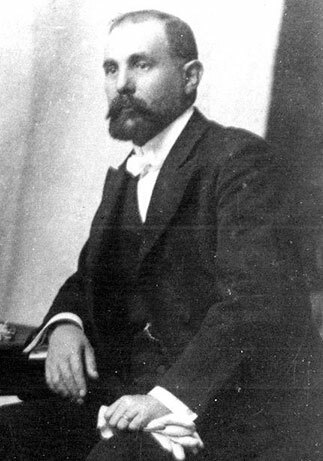 They are the work of Federico Ugalde between 1905 and 1917, and a satellite town was created with 565 houses in different styles (compact blocks of flats, terraced houses divided into flats, detached houses - single, double or quadruple). 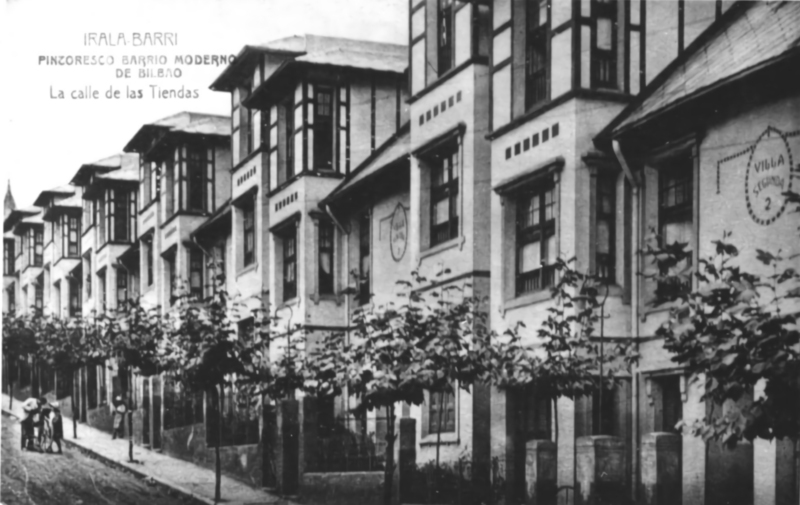 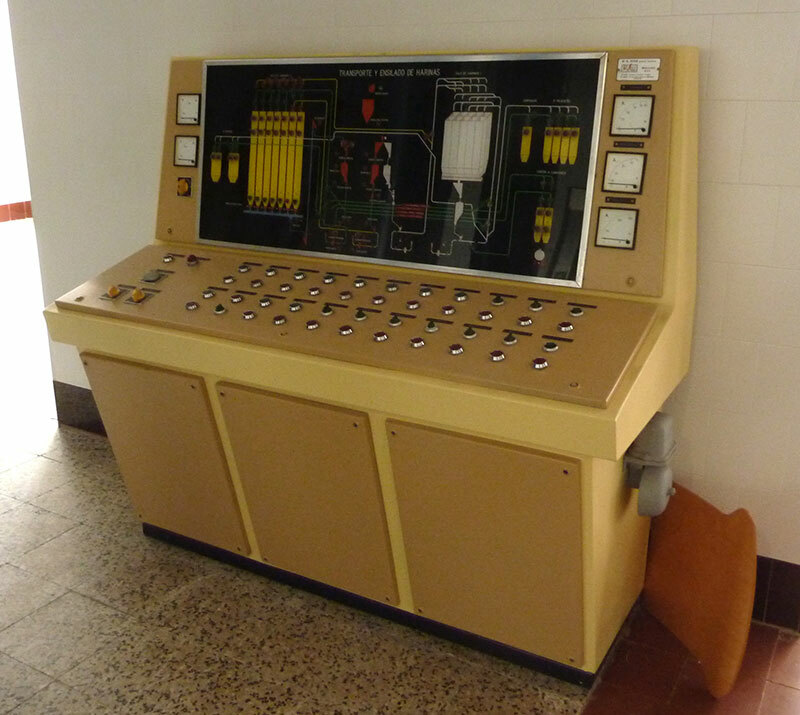 But they all had a very English style, with the principles of "sun, air and water", in line with the hygienist movement in vogue in Europe which advocated offering healthy housing to employees and workers. 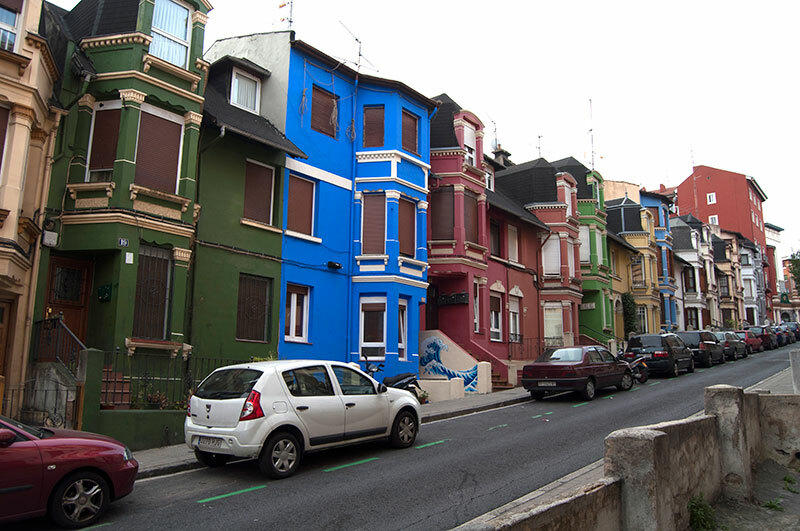 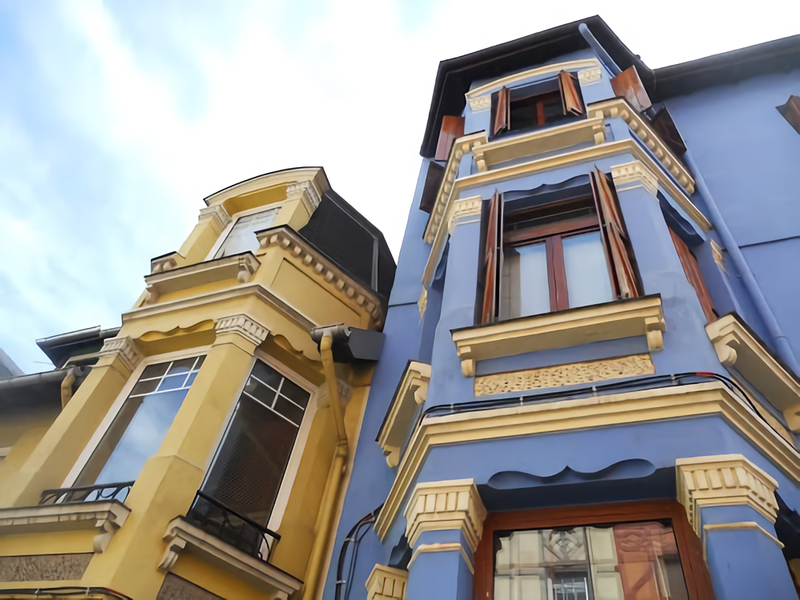 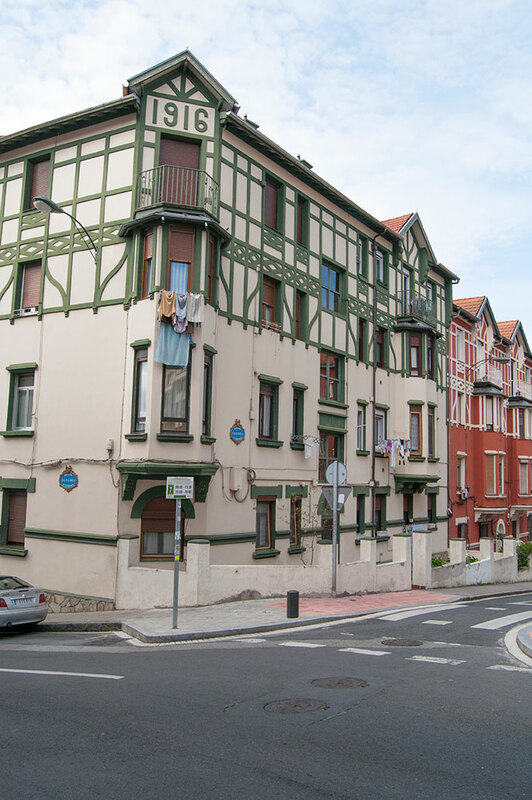 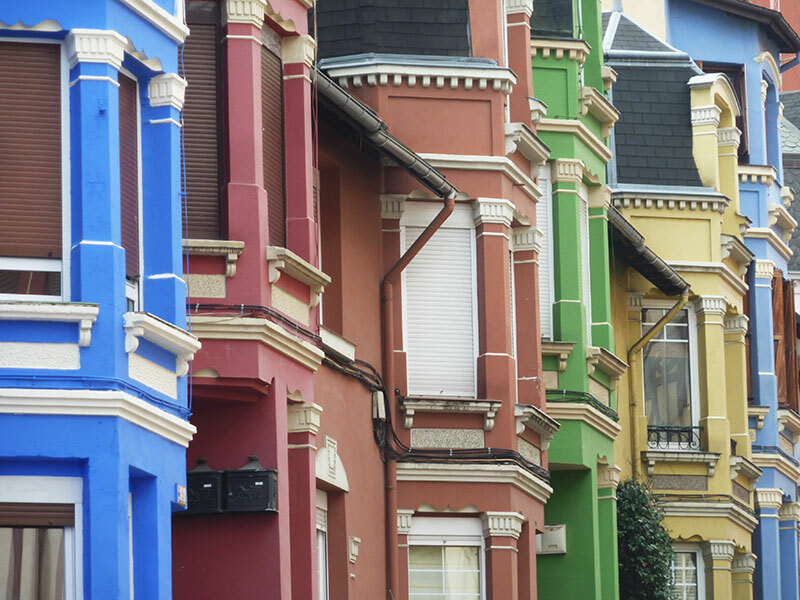 At this junction between Kirikiño street and Reyes Católicos street you can see a detached house and terraced houses with facades that have been restored in many different colours. 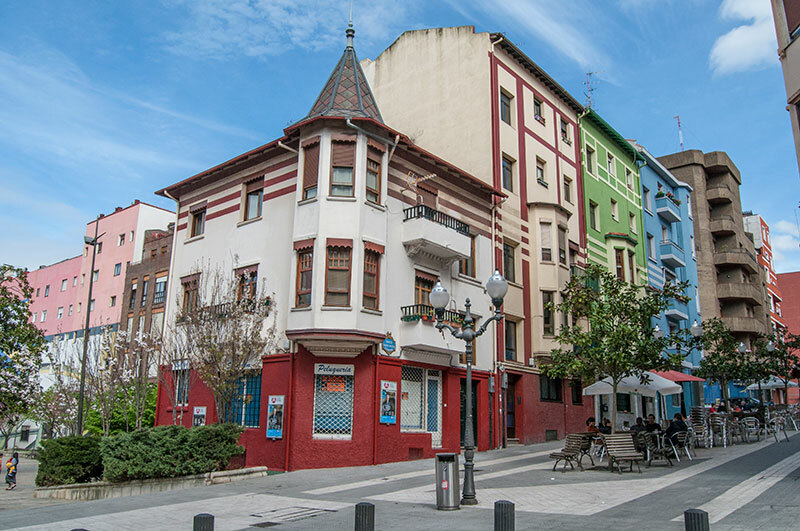 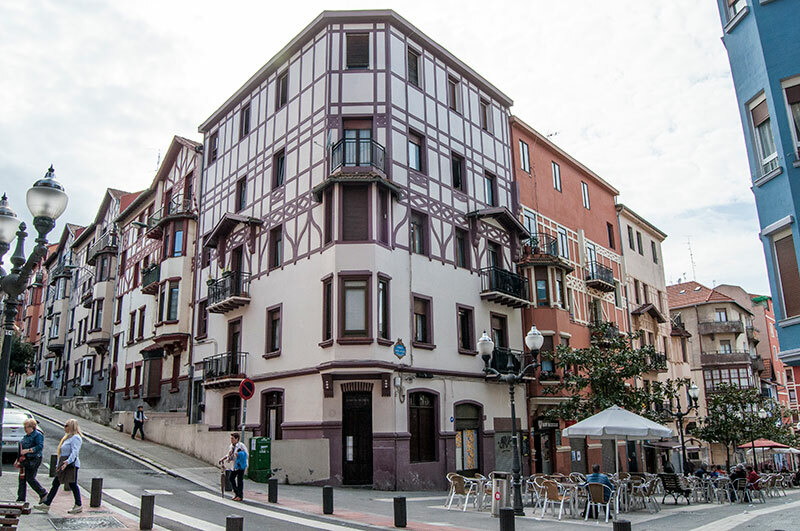 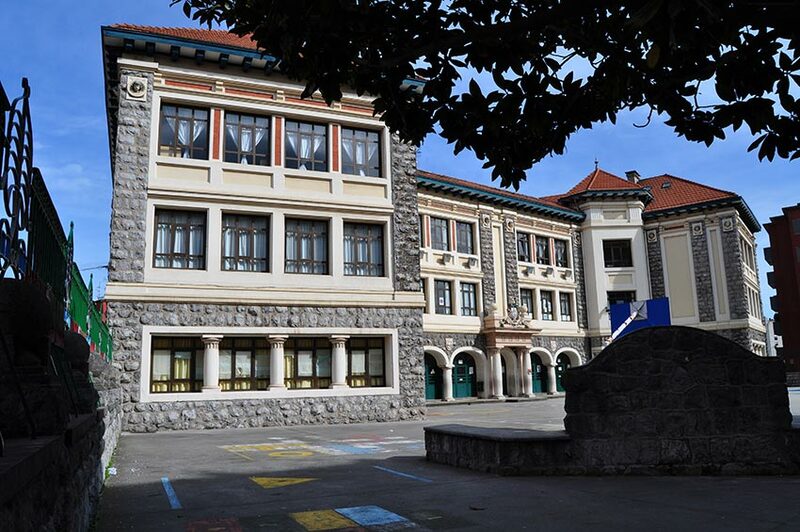 If you walk to the top of Kirikiño street and return to the same point by coming down Baiona street and Urizar street, you can see other types of building in this little district. 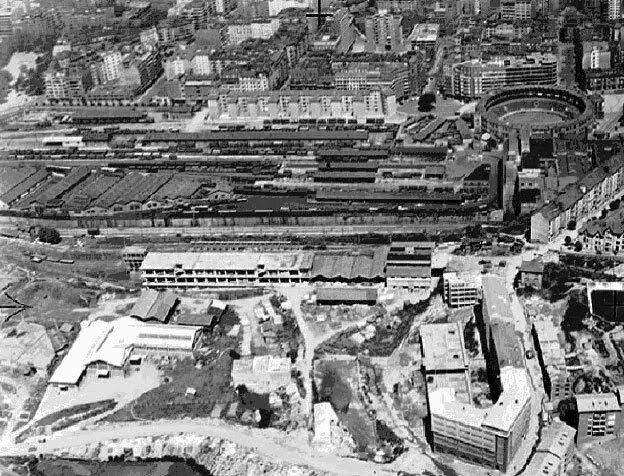 We now head to the industrial heart of the neighbourhood. 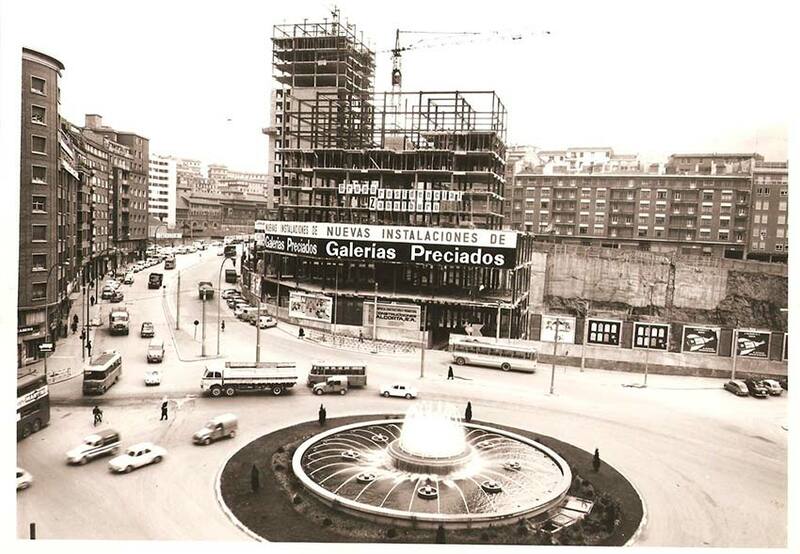 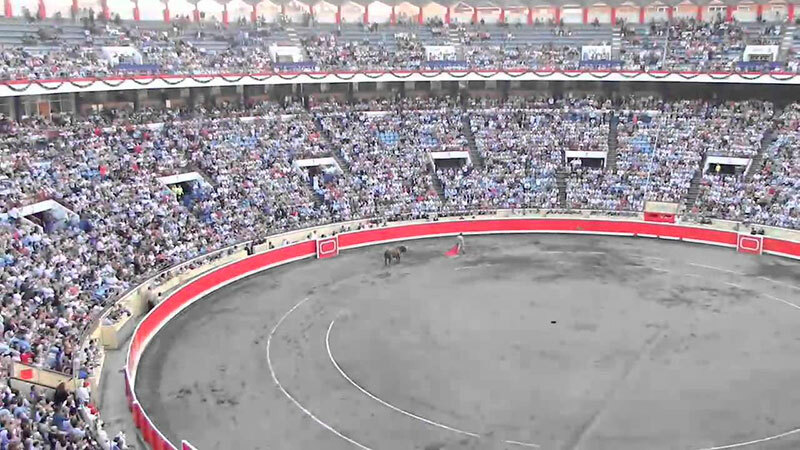 Returning to Irala street, we turn into Ugalde street and see the bullring below us. 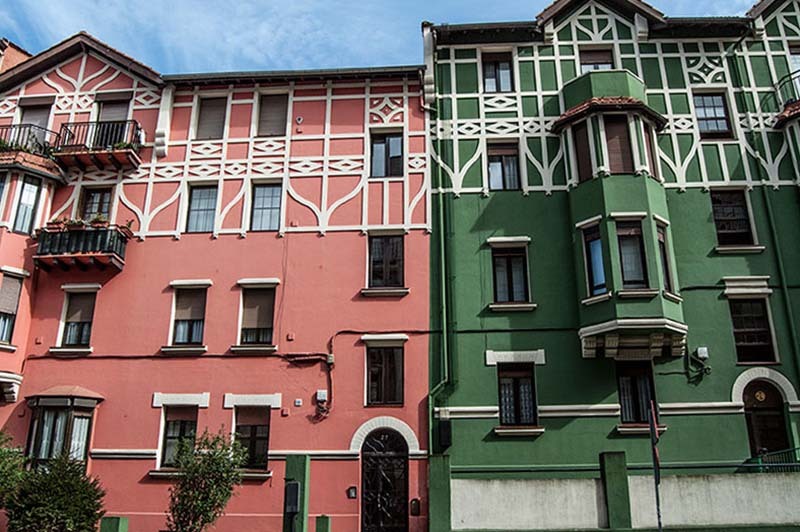 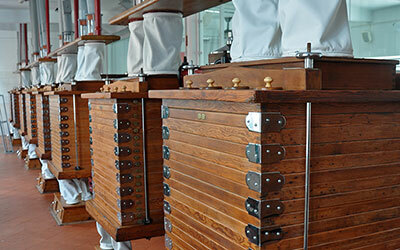 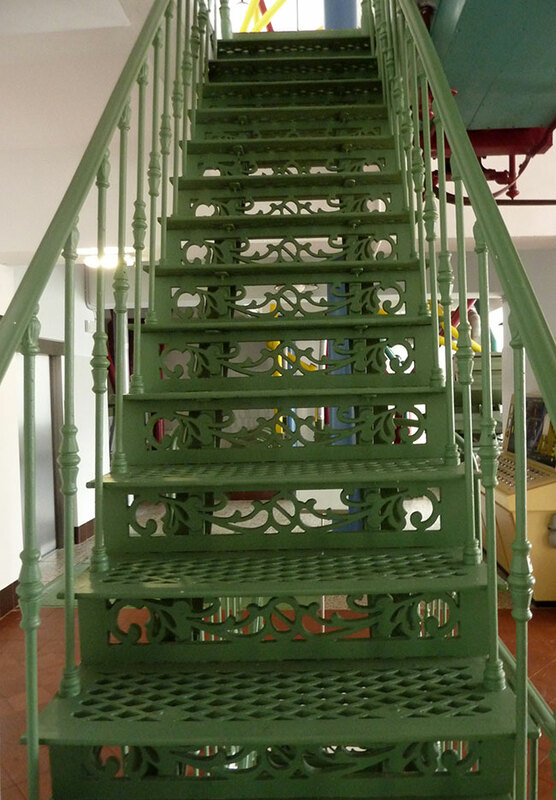 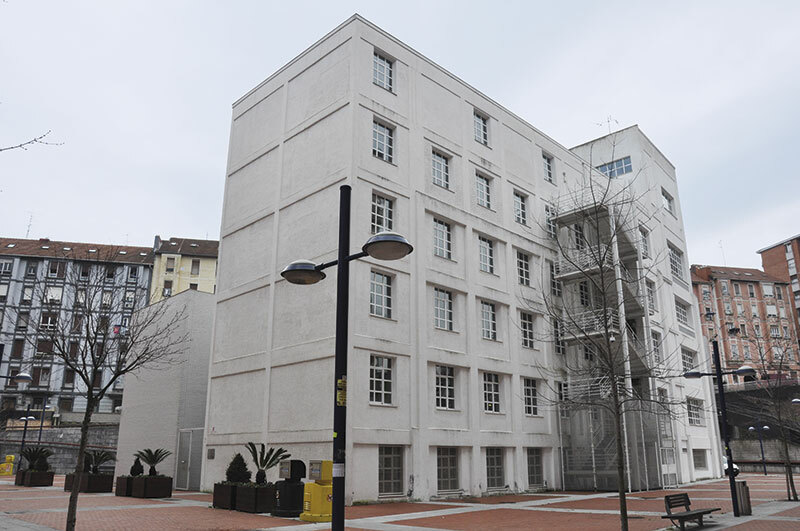 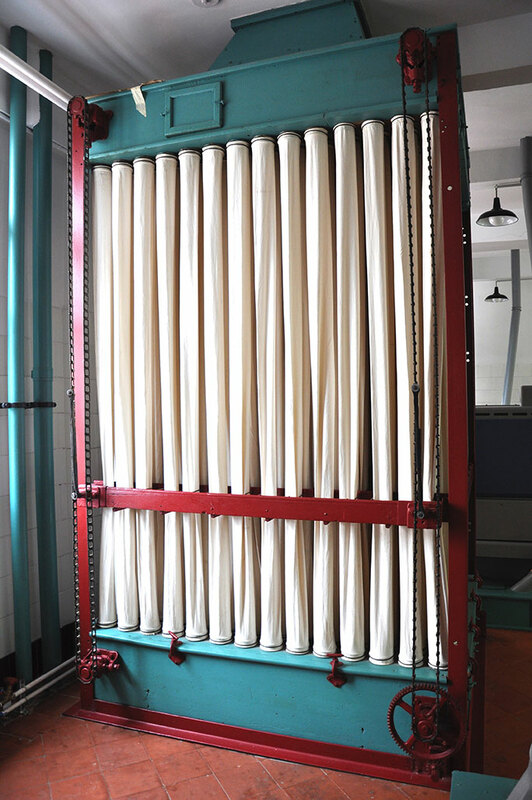 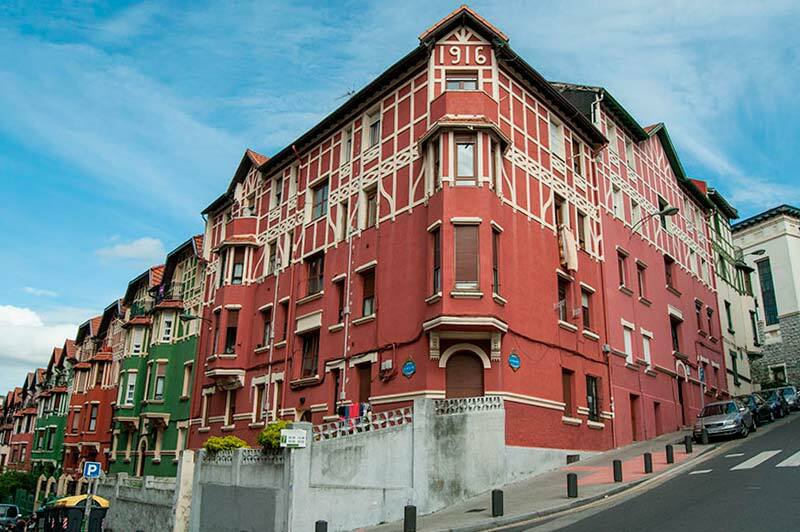 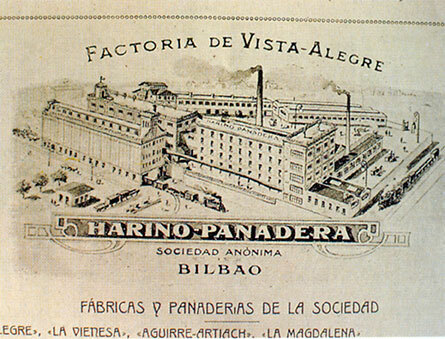 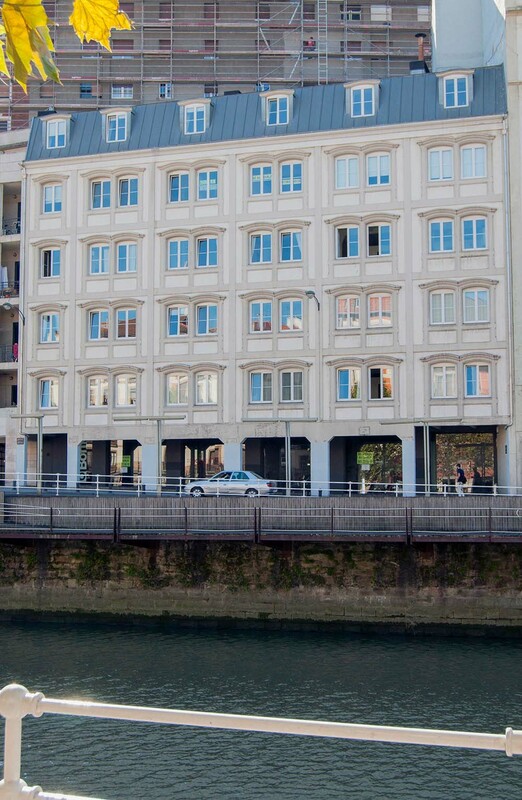 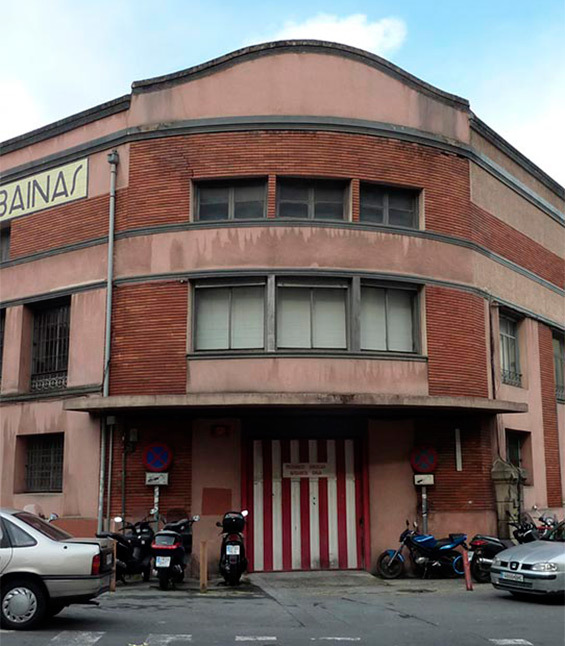 We take the first turning on the left and we find the finest restored industrial building in Bilbao: Harino Panadera. 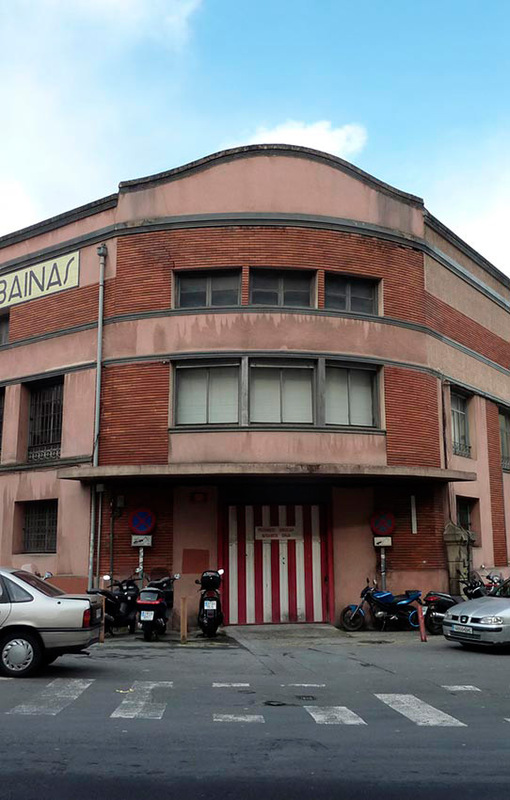 It is an old flour factory (13) which closed in 1992, built entirely of concrete in 1901, another early application of this material. 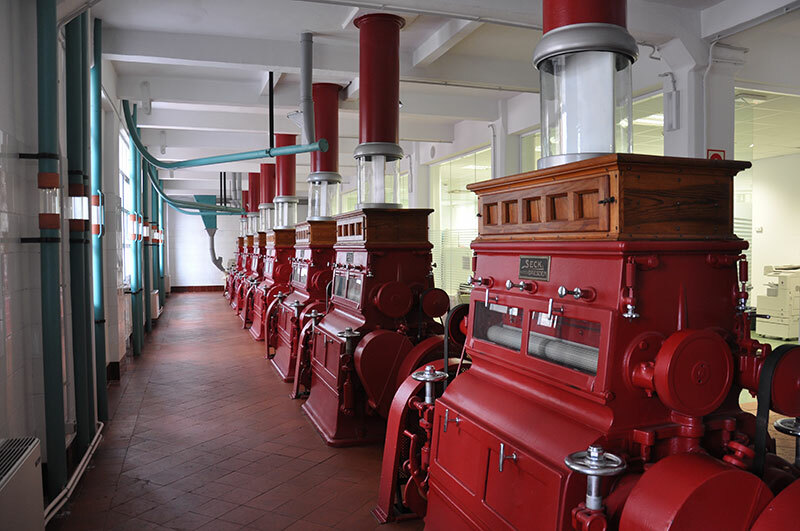 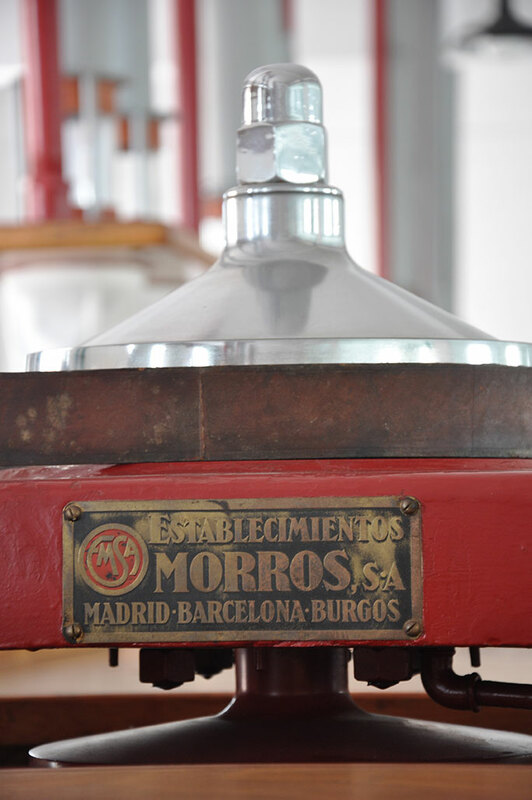 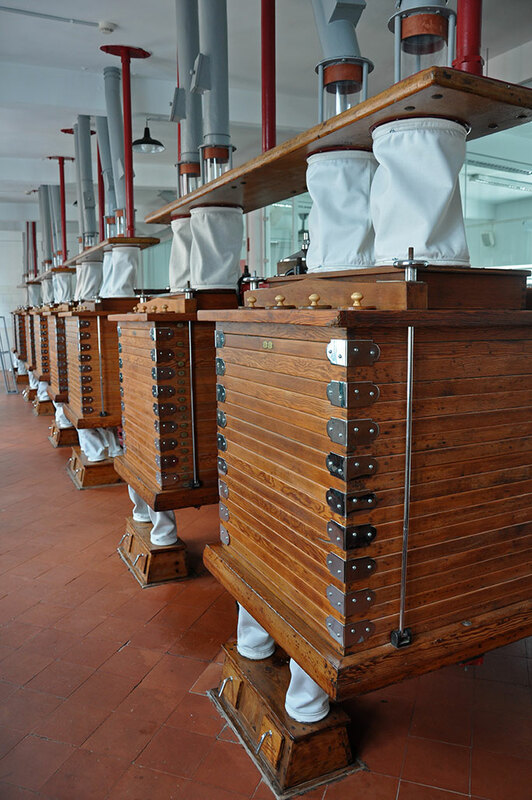 Of the stunning original manufacturing complex, only the flour factory building (Spanish) has stood the test of time (it was declared a Monumental Complex in 2005), as well as a spectacular display of historical machines inside the building, which currently houses municipal offices.